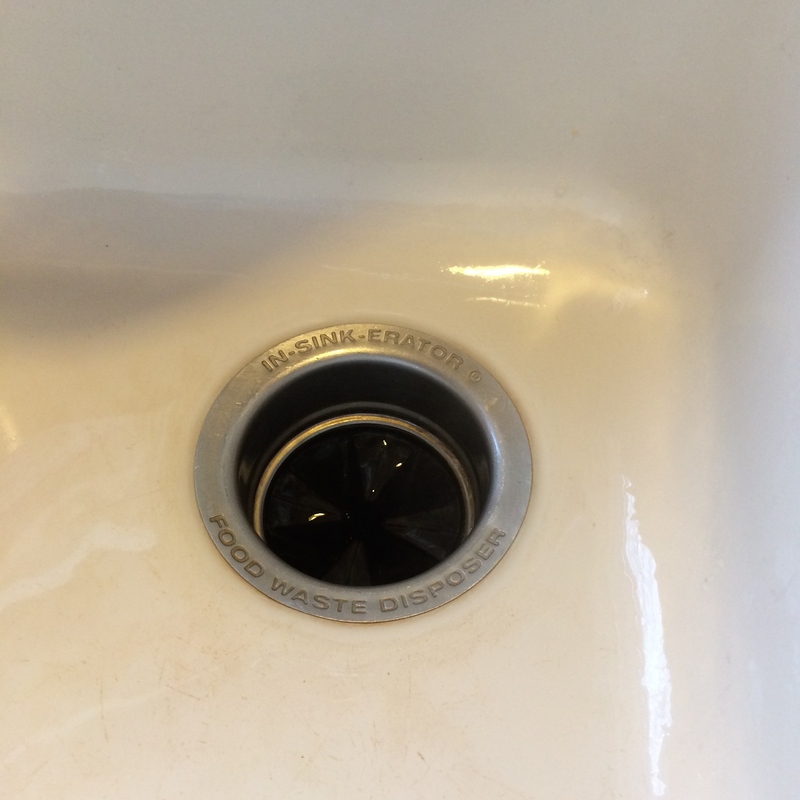 Now that you have a clean kitchen sink, you need to fix that stinky disposal. 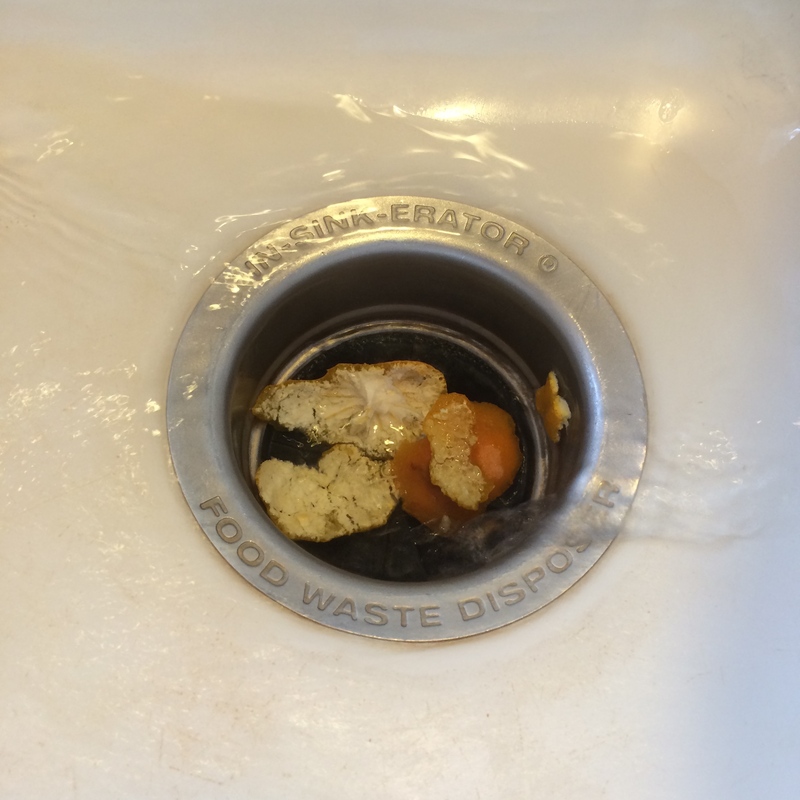 You can buy Plink balls and other stuff like that from the store, but I do have a cheaper (free even) solution for fixing a stinky drain. Citrus peels! It is easy and cheap, especially now since oranges and clementines are everywhere! 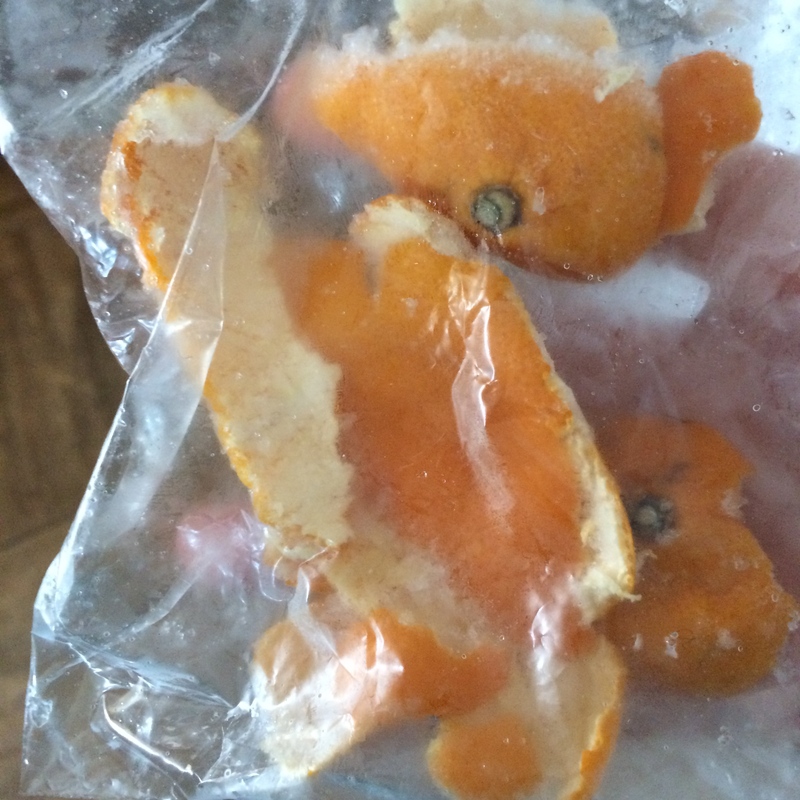 Whenever you eat an orange or clementine save the peels and stick them in a sandwich bag in the freezer, then you always have peels on hand! 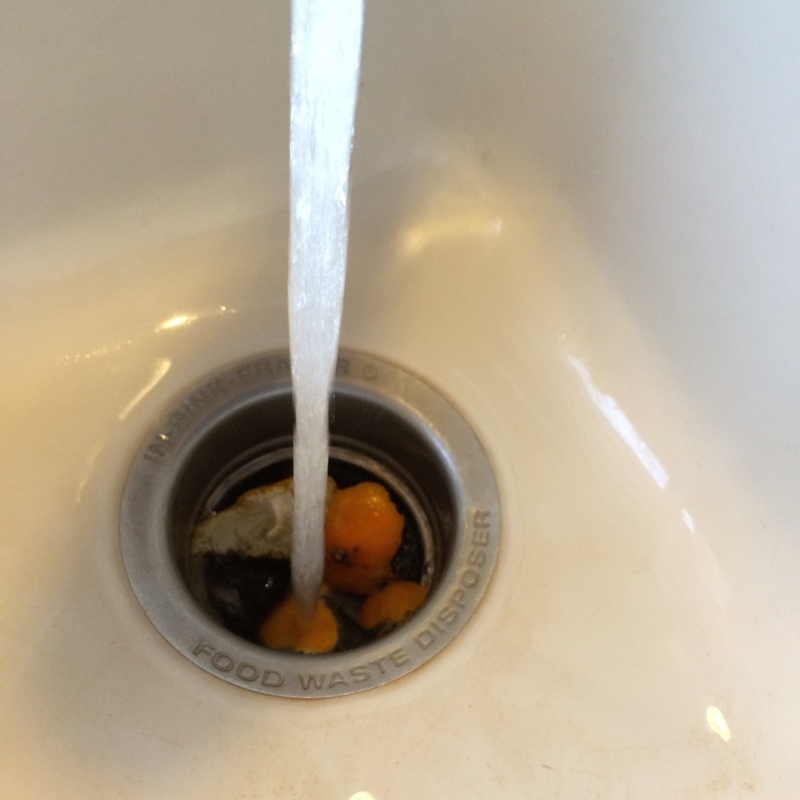 When you pull a peel out of the bag, run it under warm water until it is thawed, this will only take a few seconds. 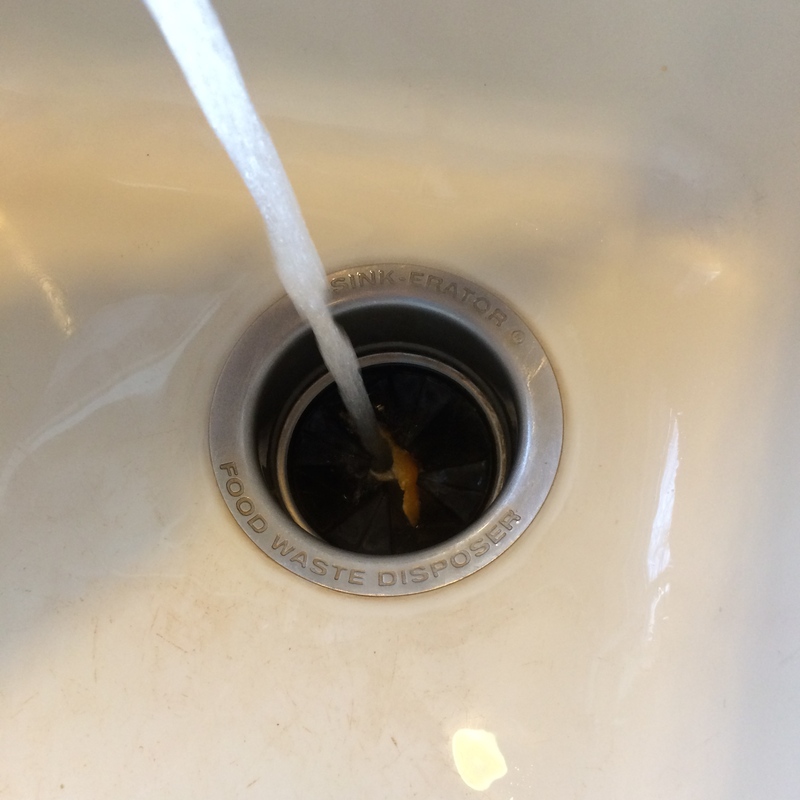 Drop it down the drain and turn on the disposal while running warm water. 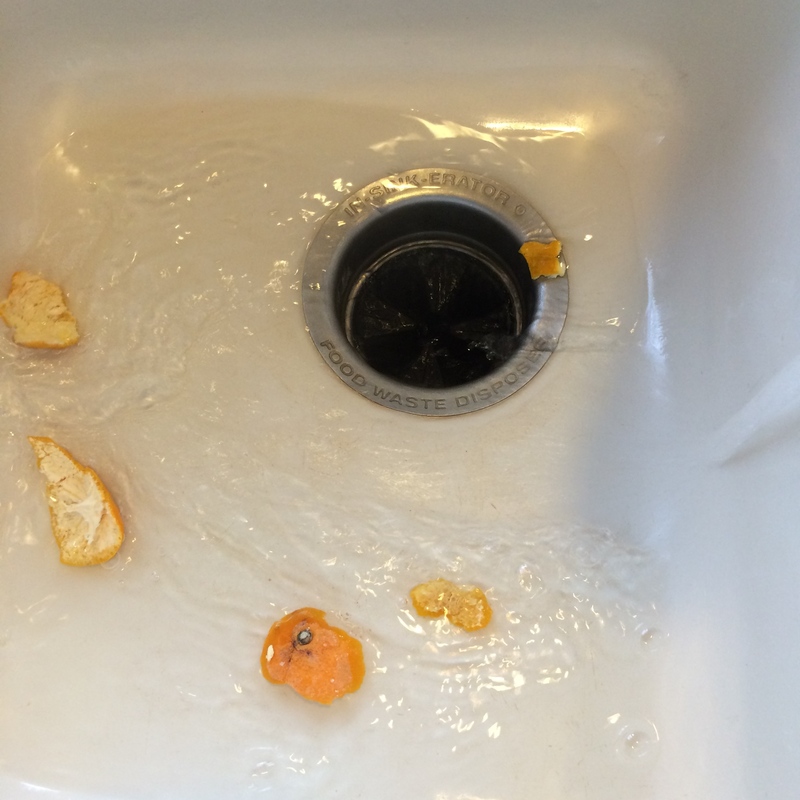 Once you no longer hear the disposal chewing up the rinds turn it off along with the water and enjoy the citrus scent! So easy! 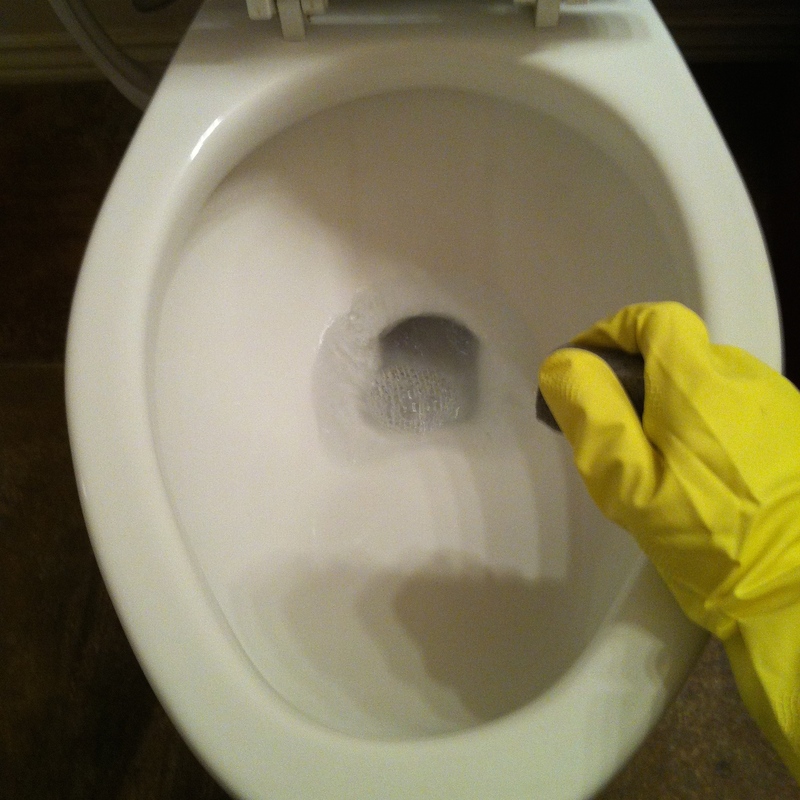 I have decided to do a weekly series of cleaning tips! 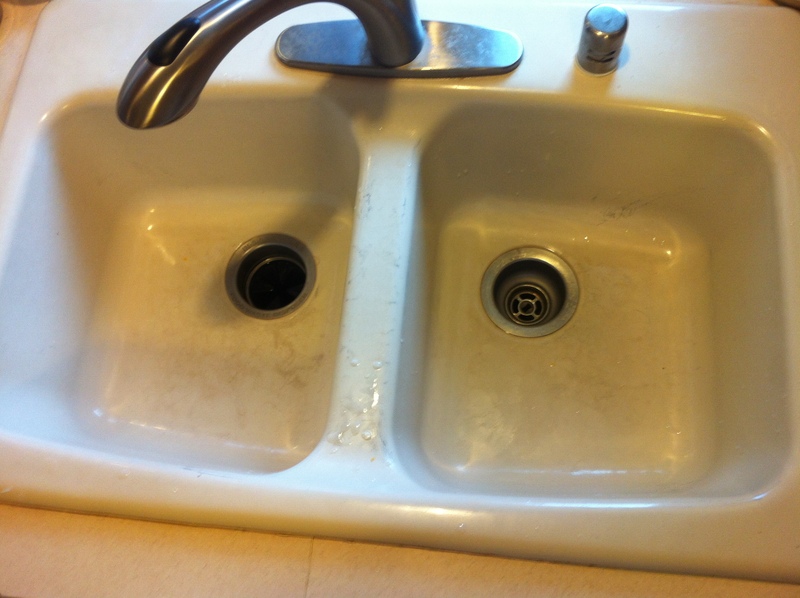 We recently moved into a new rental that I have been slowly deep cleaning and I thought, why am I not sharing these cleaning tips and information with others? Cleaning can be a daunting task, but once you have some knowledge and tools tasks can be much more manageable! 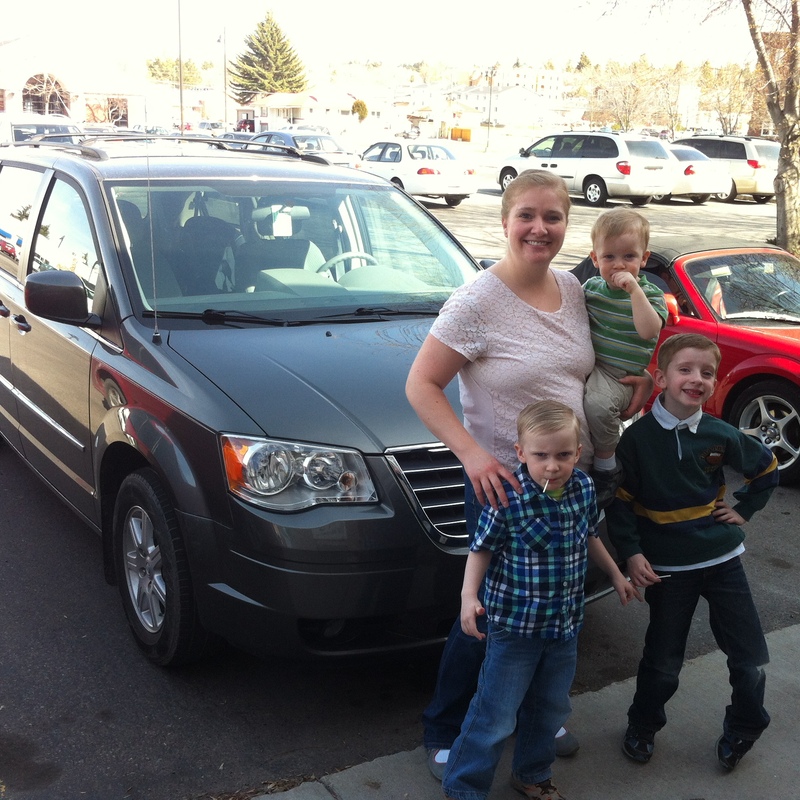 Just for some background, I am currently a stay at home mom with three little boys, I am professionally trained in cleaning homes and have cleaned a fair share of other people’s homes and businesses and I hope I can share some of my cleaning knowledge with you! If you have any questions or requests of what you need help cleaning please leave a comment and I will be sure to get back to you quickly! 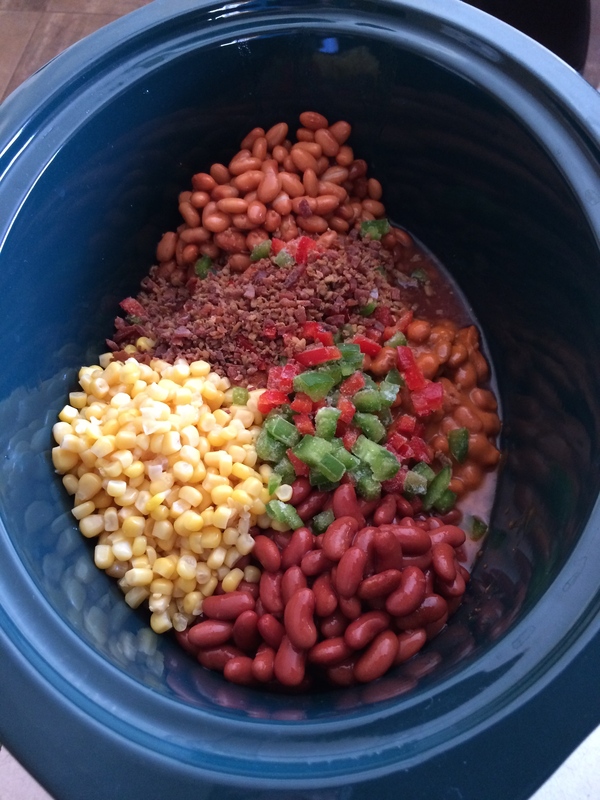 My Meat & Bean Slow Cooker Chili is so yum! 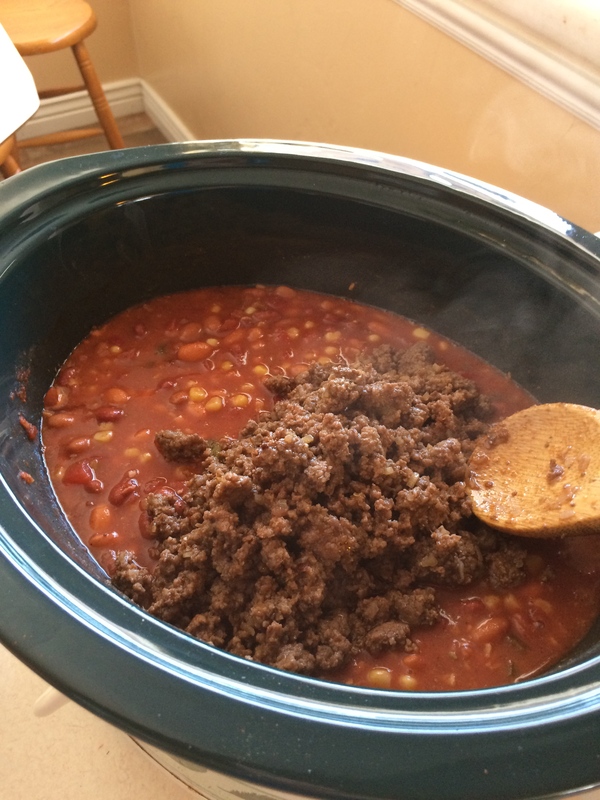 It is the only chili recipe I’ve EVER made that was completely eaten up! 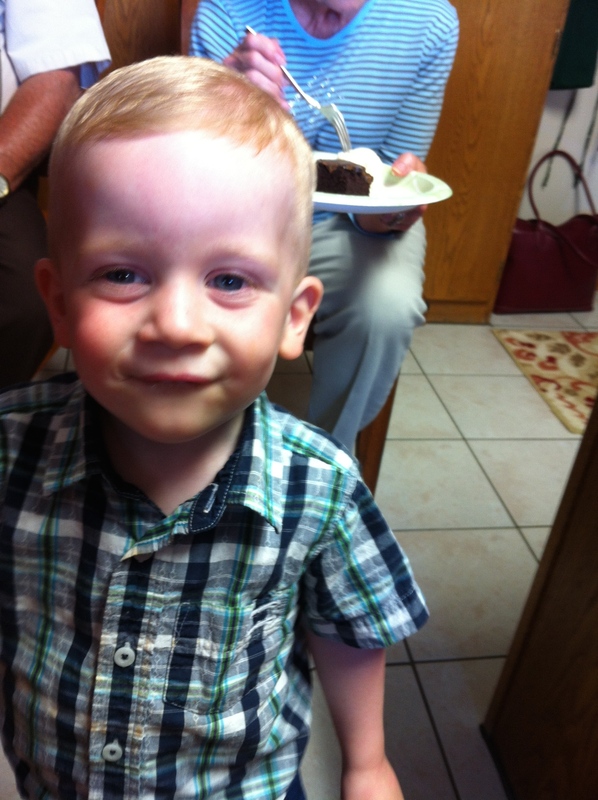 My husband and I had seconds, and had it for lunch the next day, we took some over to his grandparents, and even our two year old ate it up! I’ve made it again and instead of sharing I froze half of it to have on hand for a freezer meal for when baby #4 arrives! 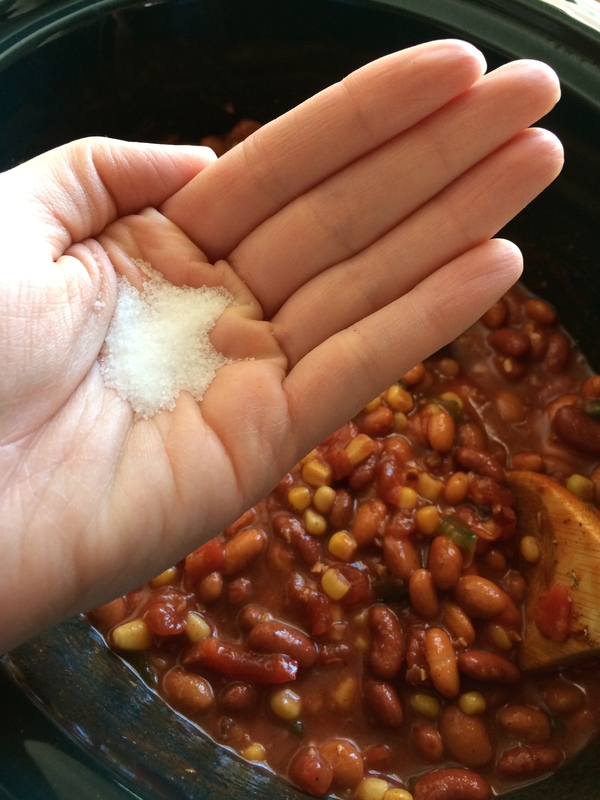 This recipe filled up my entire slow cooker. 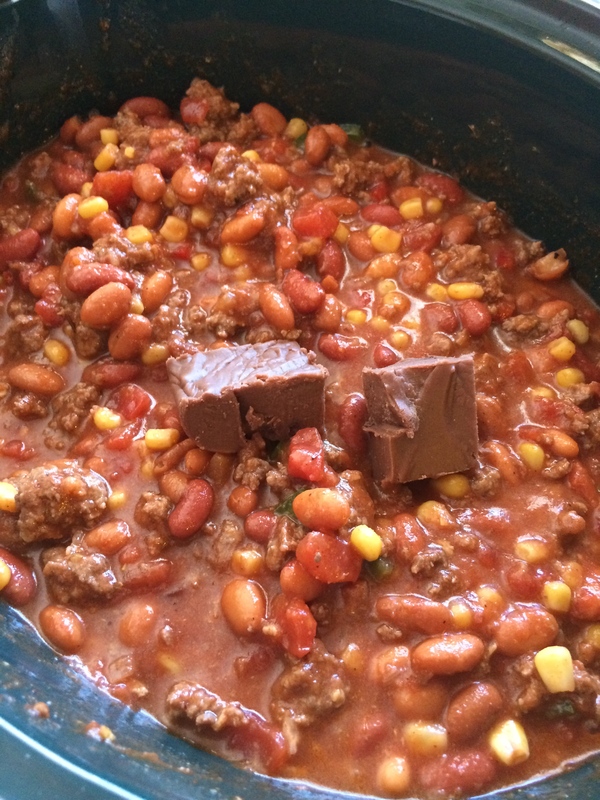 My recipe is loosely based on Boilermaker Tailgate Chili Recipe on Allrecipes.com. 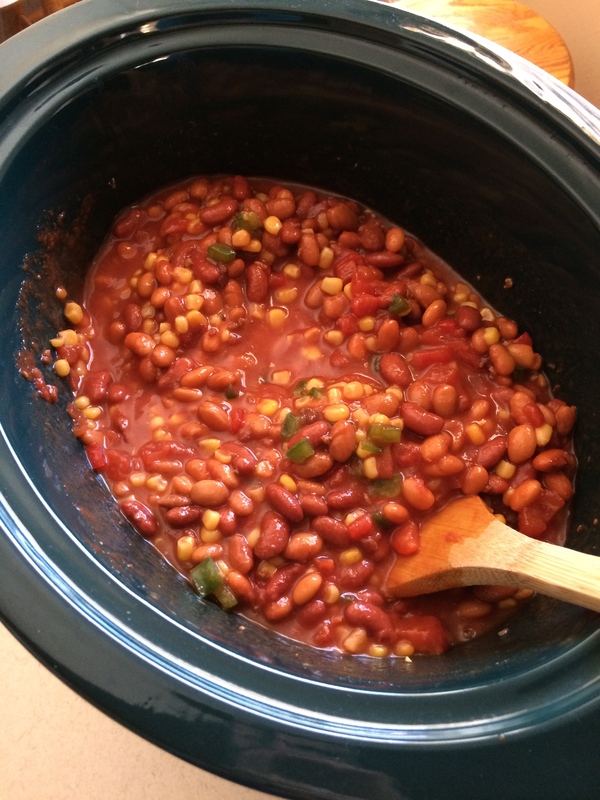 We however, like a little heat, but not the amount in the Boilermaker recipe, and that recipe made much much more chili than I wanted to make for our weeknight dinner/would even fit in my large crock pot. 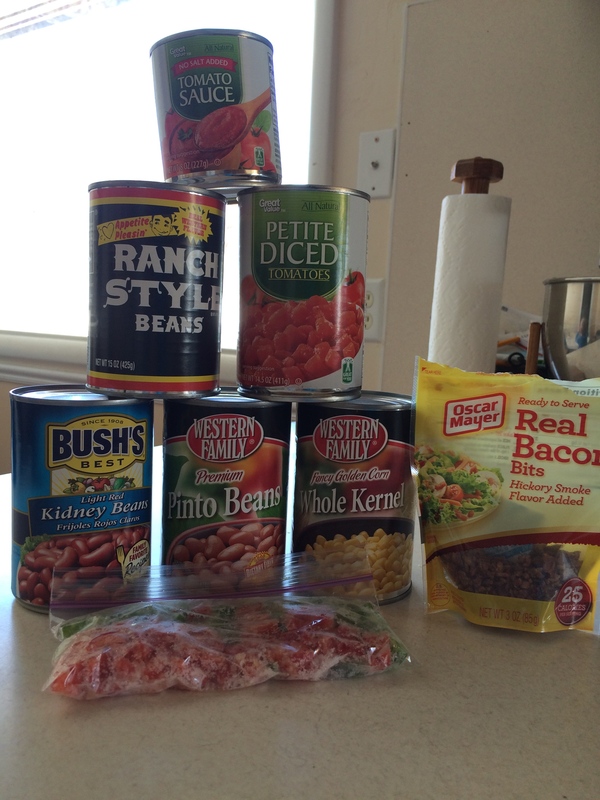 I also changed some ingredients to our preferences and what we had on hand as well as a super secret ingredient I was introduced to this summer. 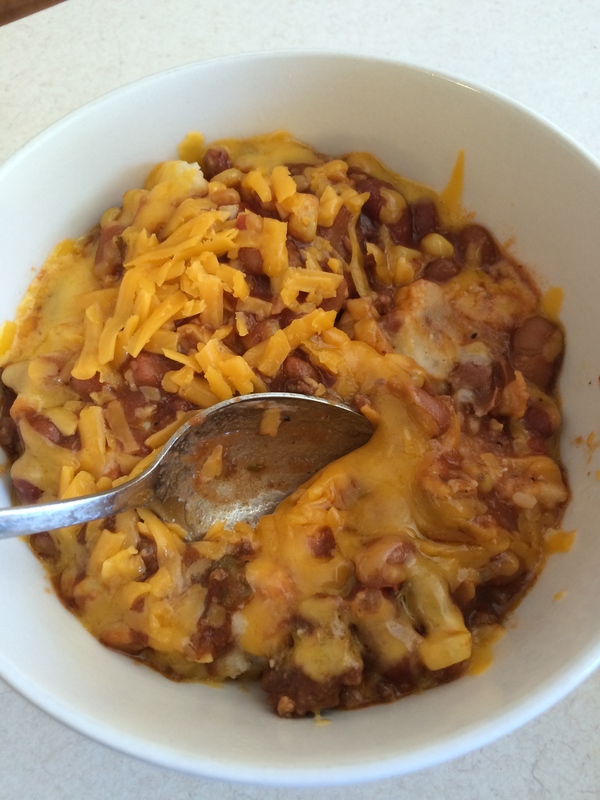 Okay, so I like a lot of cheese on my chili, can you blame me? 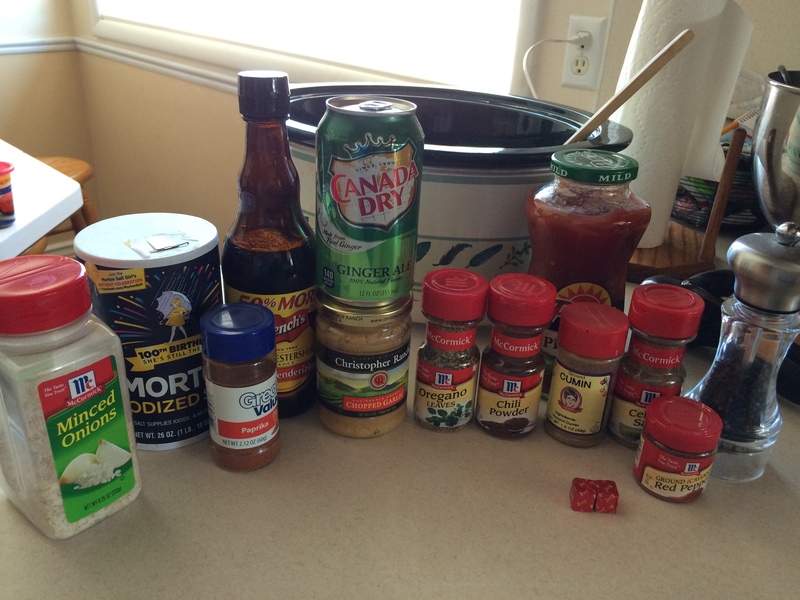 Pour all of these ingredients in your slow cooker and turn it on low. -Cook the ground beef with half of the onion, then pour cooked ground beef, and the rest of the ingredients into the slow cooker. -Stir it all together and cook on high for 2 hours, and on low until you are ready to eat, or at least one hour. Serve over mashed potatoes, or rice or tortilla chips or Fritos and top with cheese! Enjoy! This is now our favorite chili and it deserves to be shared! 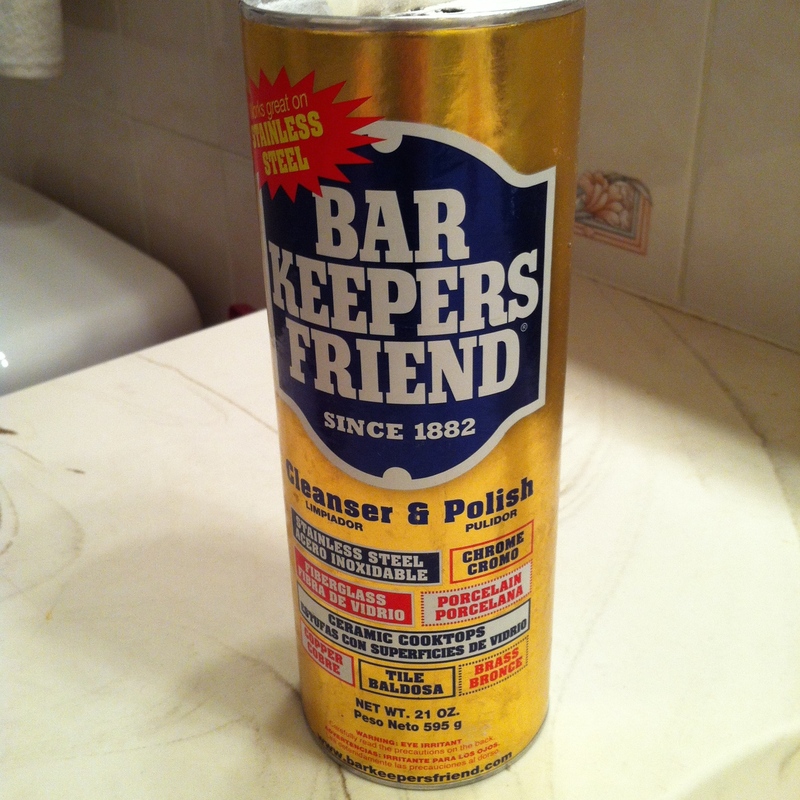 Bar Keepers Friend or Comet, a scrubbing pad (SOS Tuffy pads are my favorite!) and rubber gloves. 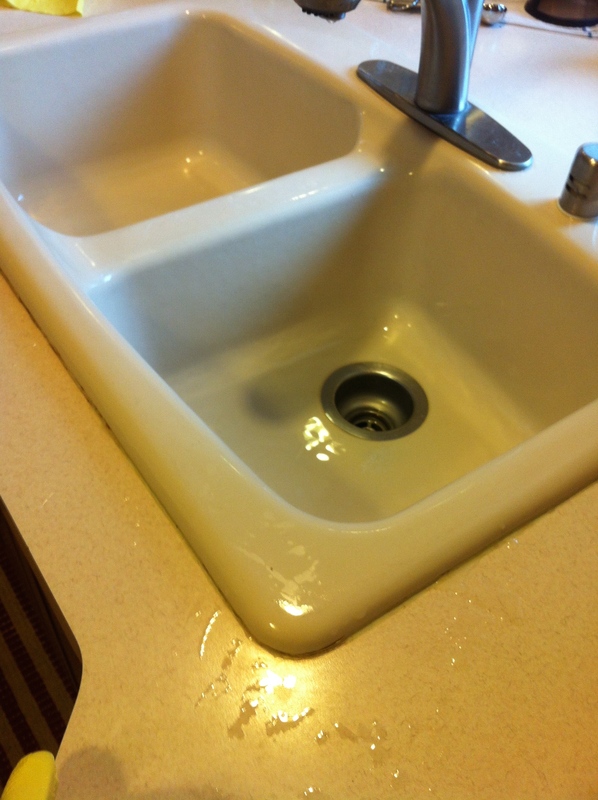 -Once you’ve scrubbed everywhere, rinse out the sink well. 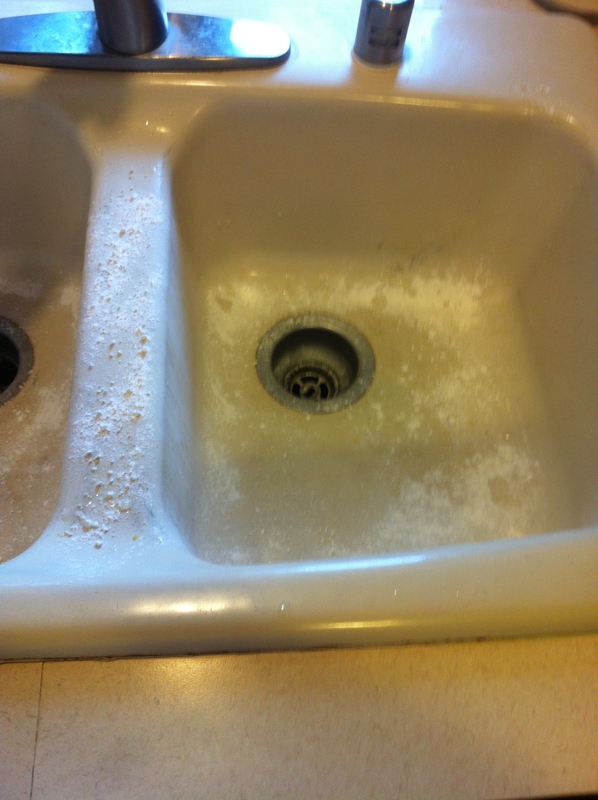 -Now you have a clean sink, you’re done! Alrighty people, you can go down a worm hole of dehydrators, I have owned two and dried apples for about 5+ years. The dehydrator shown is my favorite of the two: Presto Brand, Dehydro Food Dehydrator. (I do not receive any money or compensation for mentioning this dehydrator, I just really like it.) Why is it my fav? The trays are made so you can collapse them and so your dehydrator isn’t so tall and awkward for storage. Also, it has a fan that blows warm air instead of only having a heating element at the bottom. My previous dehydrator only had a heating element and I had to rotate trays every couple of hours, but I don’t have to do that with this dehydrator. The fan is a little loud, but not bad. Another thing that I like, though I haven’t tried yet is that the Dehydro can dry meat as well as fruit and veg. In the owners manual there is a list of additional trays, like if you want to dry fruit leather, you need a different kind of tray made for liquids, or chopped vegetables will need a screened tray. The dehydrators with fans also take a lot less time to dry so you can do batches is less time. So, how do you go about drying apples? 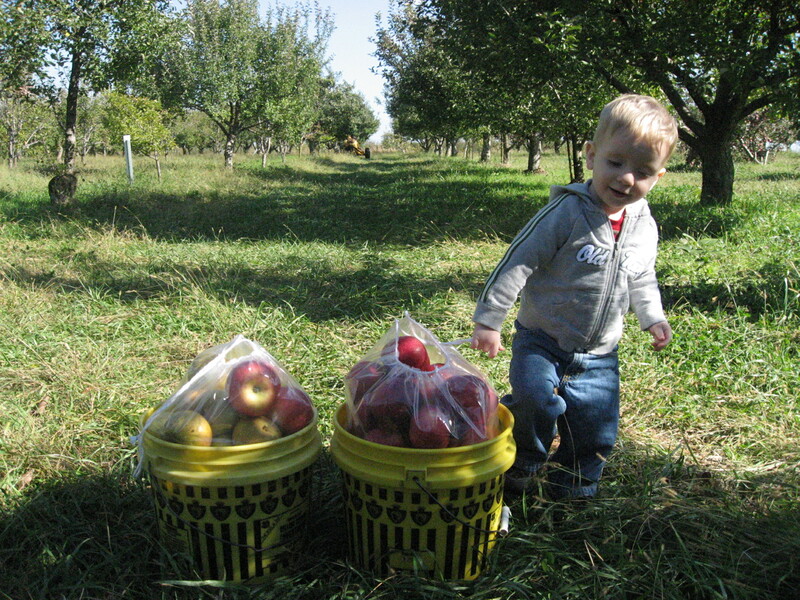 First, go to an orchard or if you local store is having a sale on apples buy a few pounds. 1. Core and peal apples. Generally I cut apples into quarters and cut the core out and then peal the quarters. 2. Cut apples. Once I peal the quarters I cut each quarter in half, and then each of those slices in half again. So you should get about 16 slices per apple. 3. Acid. 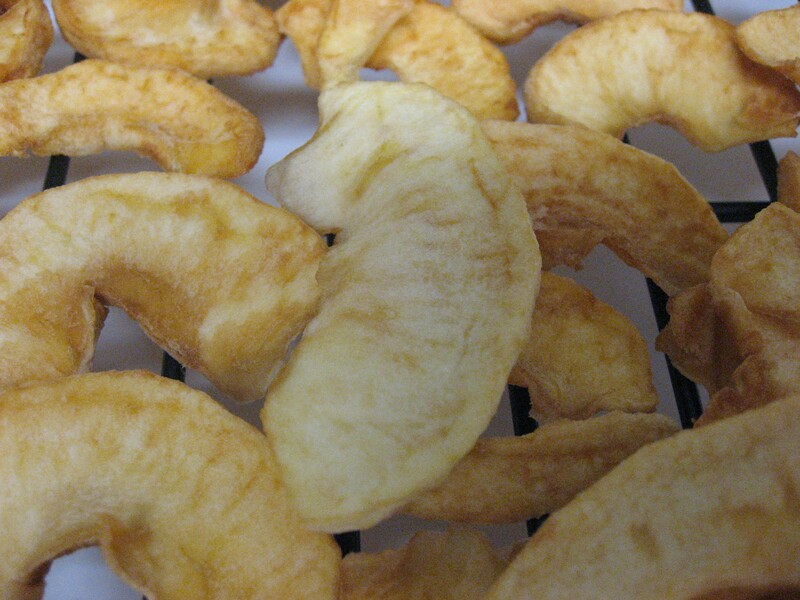 Soak your apple slices in pineapple juice, or any other kind of acidic juice. Generally I have a large punch bowl and put my juice in it and as I slice apples I just toss them in and occasionally stir the juice around to make sure the apples get juice on all sides. 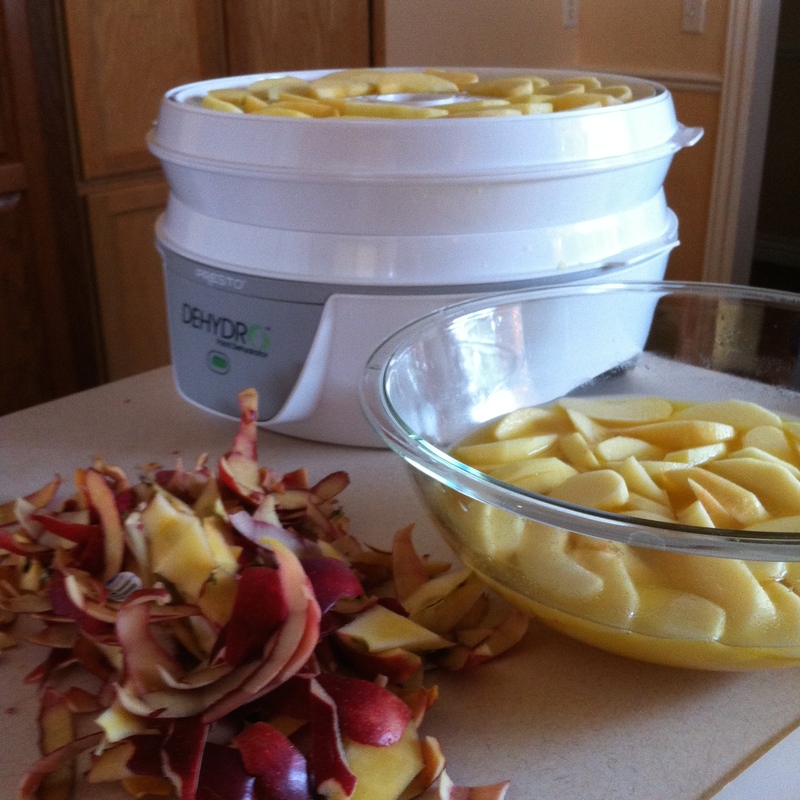 Once I run out of room in the bowl then I start putting apples on the dehydrator racks. 4. 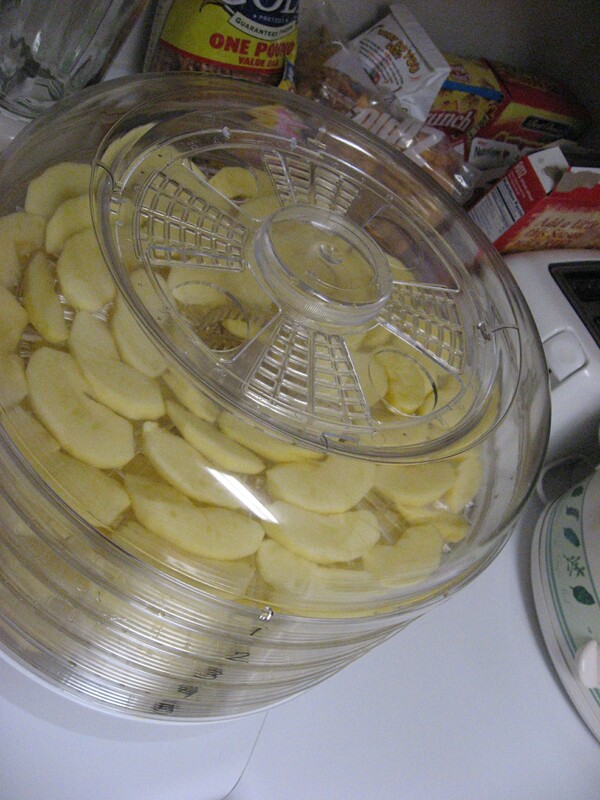 Put apples on dehydrator racks. Do not overlap apples, though they can touch. If you have them touching on all sides or overlapping they will not dry evenly. 5. Plug in the dehydrator once all the racks are filled and the lid is on. Follow drying instructions in your particular manual. 6. Finished apples! Pictured are apples from my first dehydrator. They always turned out darker than the ones I get from my new dehydrator. 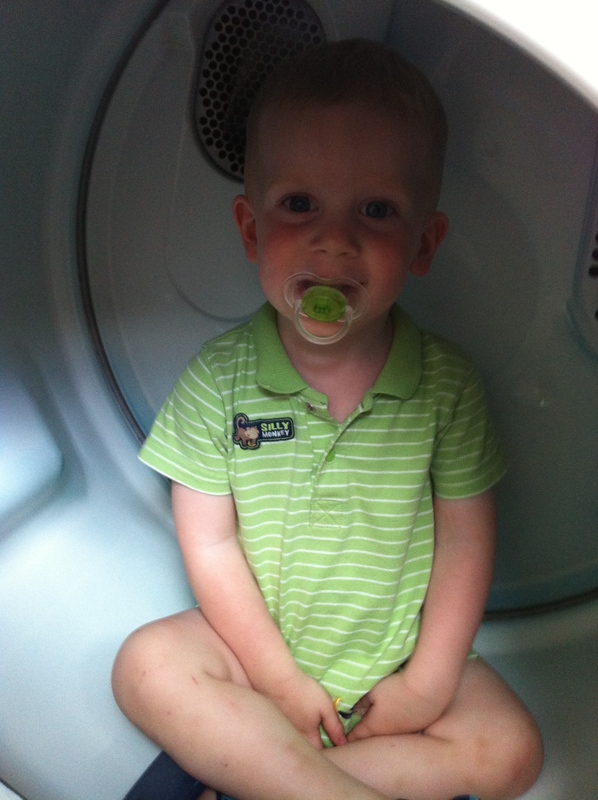 I think this is because it took a lot longer for them to dry. My new dehydrator gives me apples that are pretty much the original flesh color with very little browning. Either way they still taste great though. 7. Cool Down. Place apples on a wire rack to cool for a few minutes. It doesn’t take long for them to cool down. 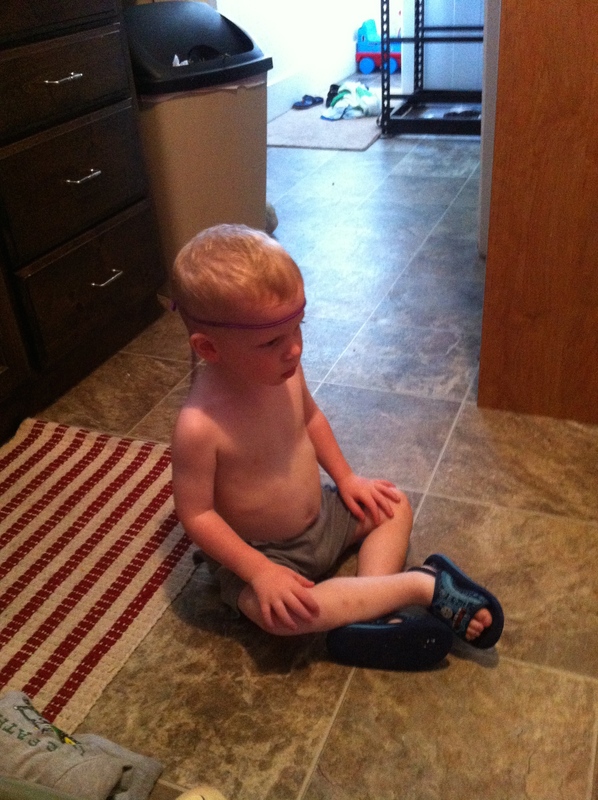 Just remember that as they cool they will become more stiff, less flexible, less chewy. 8. Snack or Bag them. You can eat them right away or bag them. I found that with my dehydrator I can just stuff my four racks of apples into a freezer quart sized bag. I then write the date on the bag and stick them in the cupboard for later eating. Mmmmm! 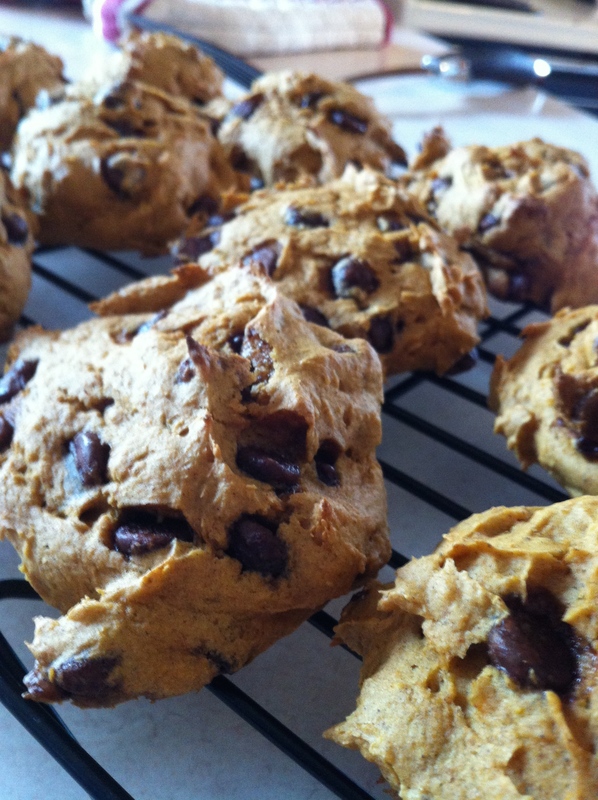 These Pumpkin Chocolate Chip Cookies are a family favorite around my house and so simple! There are only three ingredients, so I often have everything I need on hand, they are a great go-to for a fall or winter treat. 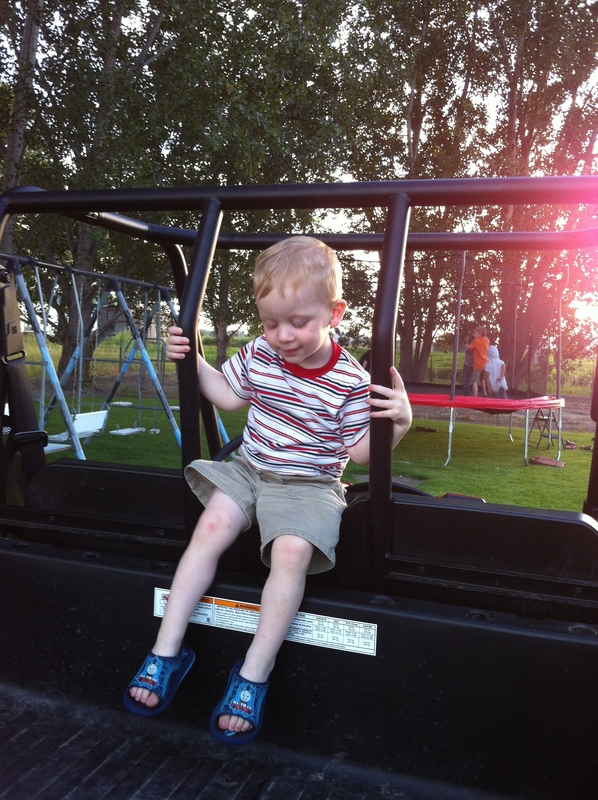 I have made them for years, taken them to numerous events, kids love them as well as adults, they are always a hit! 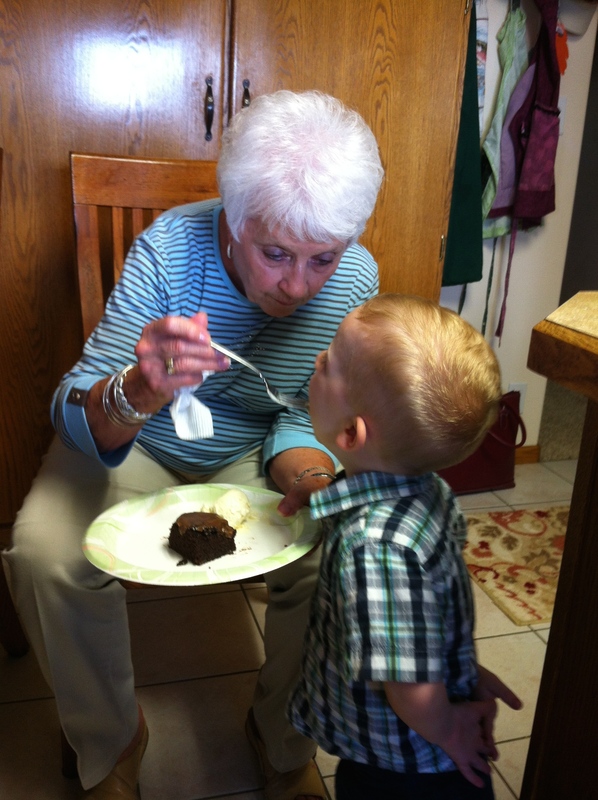 Preheat the oven to 350* and put the cake mix and pureed pumpkin in a large mixing bowl. 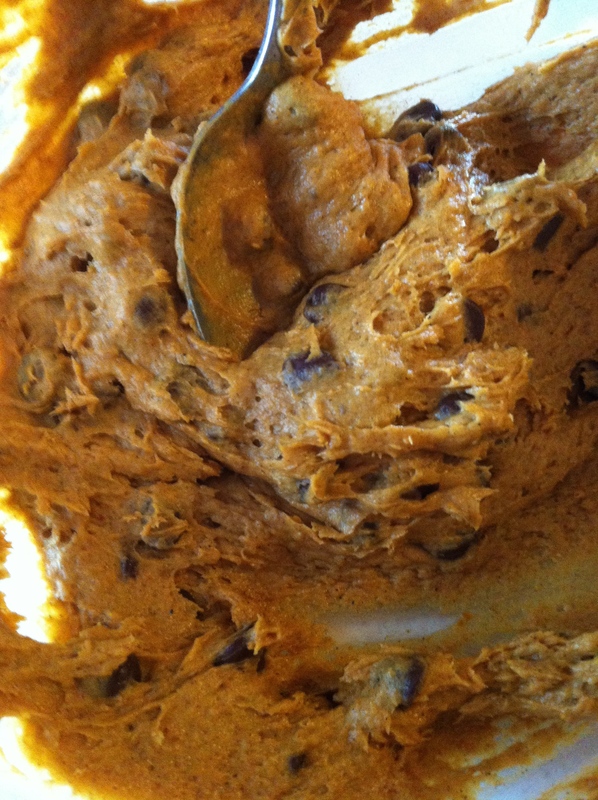 Use a hand mixer to mix until smooth. 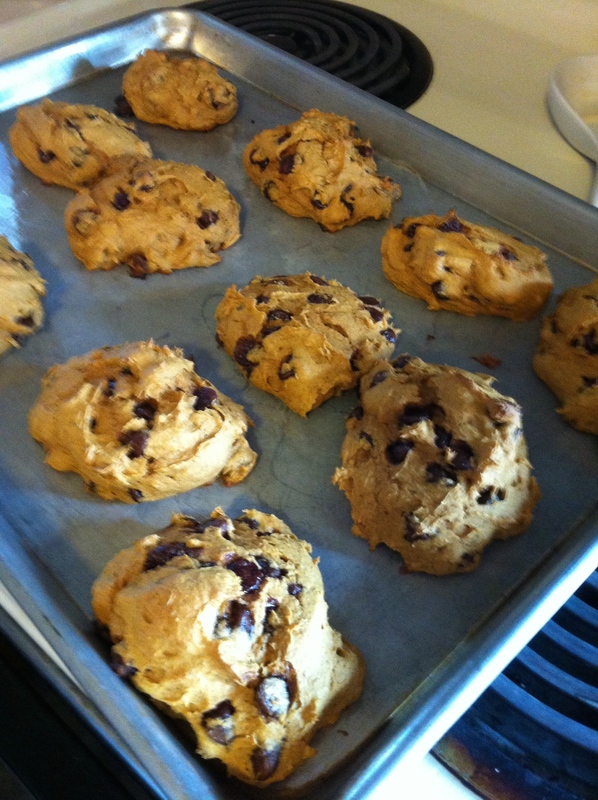 Then add in chocolate chips. Once the cookies are done, (you can tell because the tops will all be a uniform color, as shown) then put on a cooling rack. 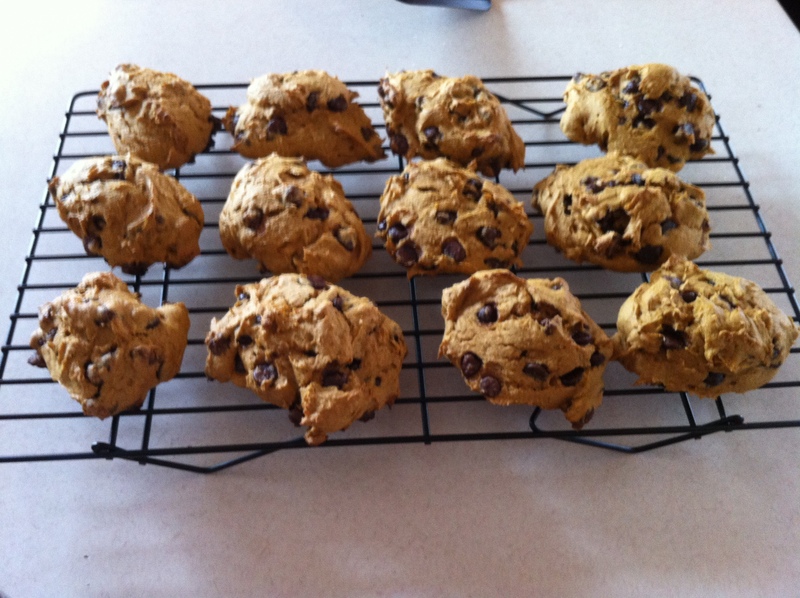 This recipe will make about two dozen cookies, depending on how big you make. Enjoy! 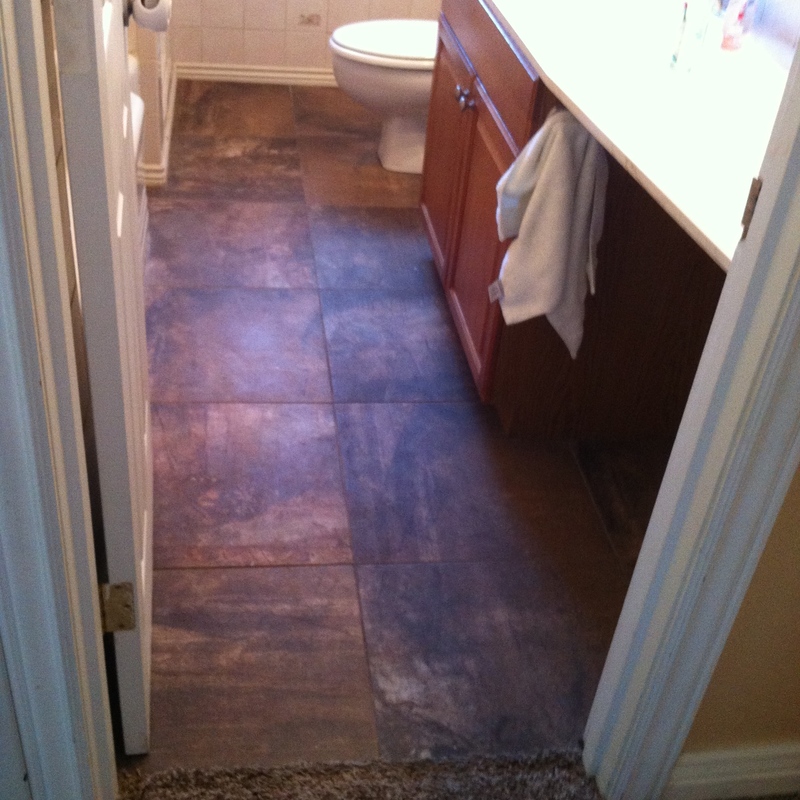 Floors. What can I say about them? They can be awkward to clean for sure. So after you have cleaned the rest of the bathroom get ready to clean the floor. It will take no more than 10 minutes. First, remove all trash cans, bath toys, towels, laundry baskets or whatever else may be on the floor and put them in the hall. Then get out your broom and sweep. While you sweep remember to sweep along the tops of the baseboards as well. 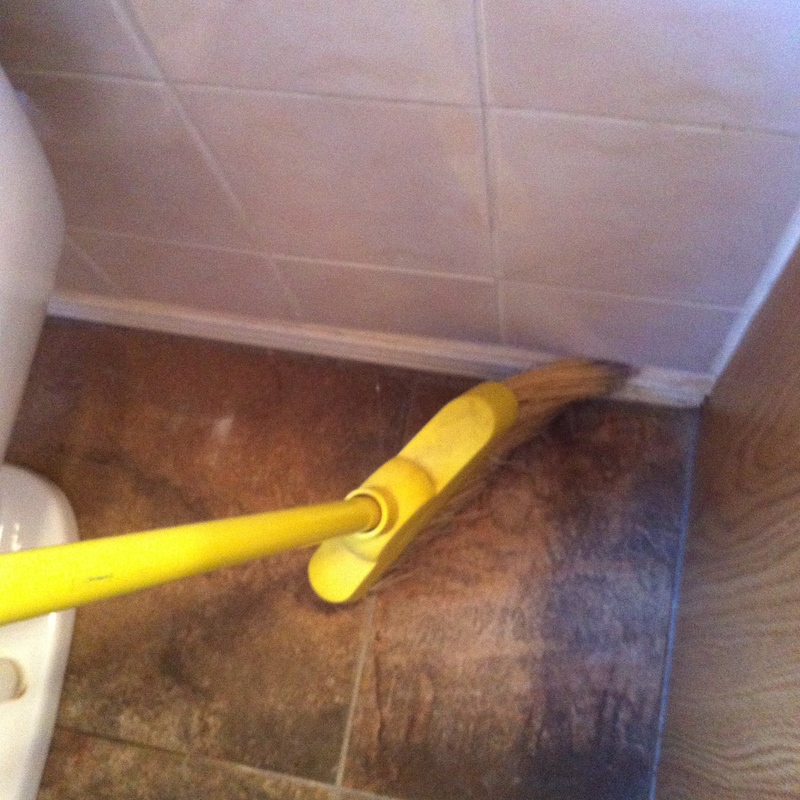 Once you have swept everything use your trusty dust pan and brush and sweep it up. 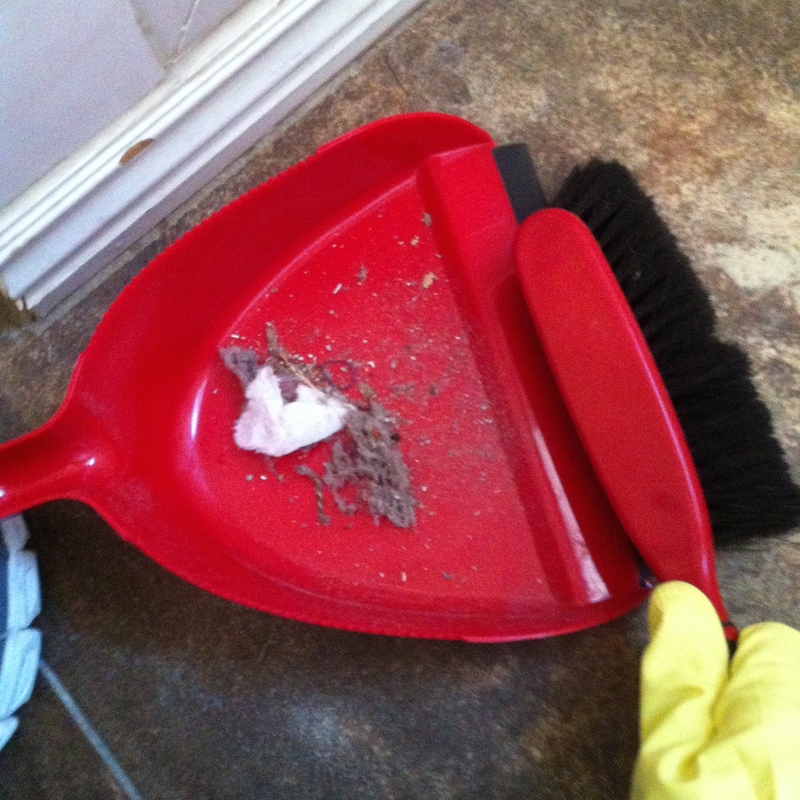 A dustpan and small brush are way more convenient than trying to sweep your dirt into a dust pan with your big broom. I think I bought my dustpan and brush for $8 at the local grocery store. 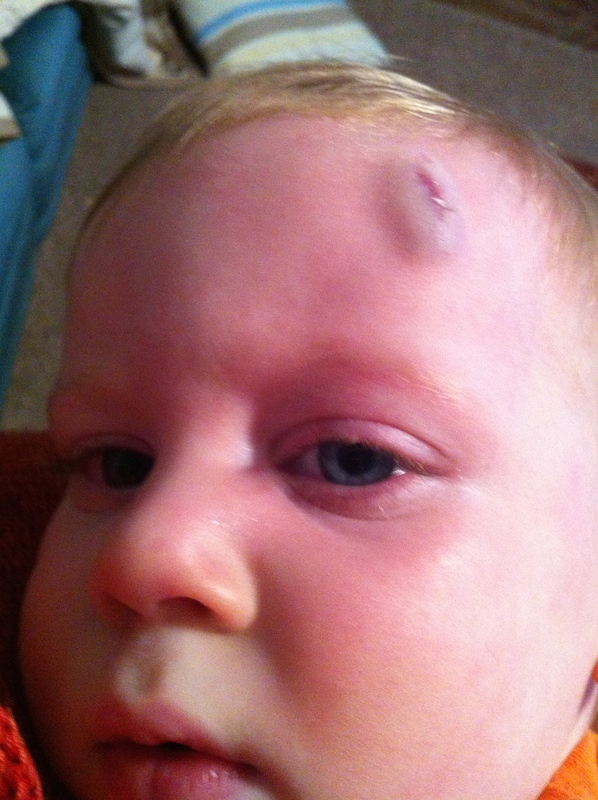 After you sweep, do NOT get out your mop! 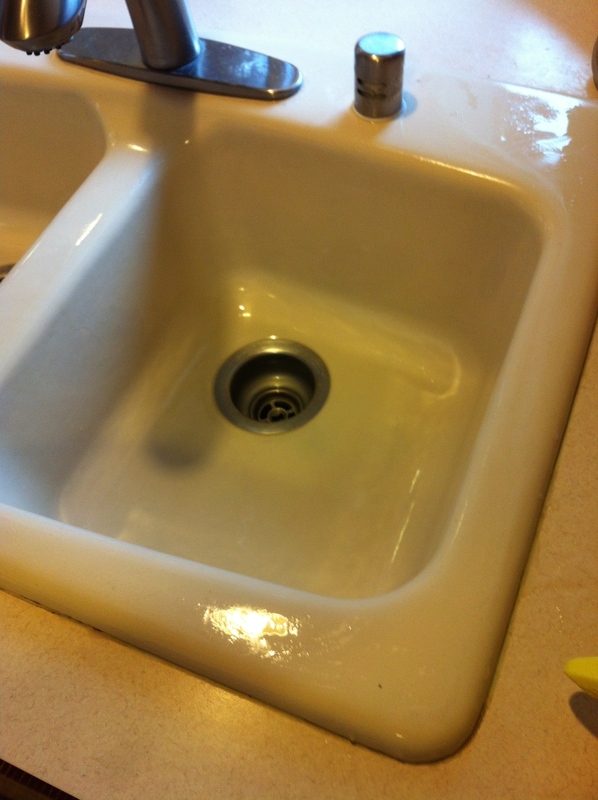 You will get a faster, less messy and more thorough clean if you just use your favorite all purpose spray cleaner and a cleaning rag. 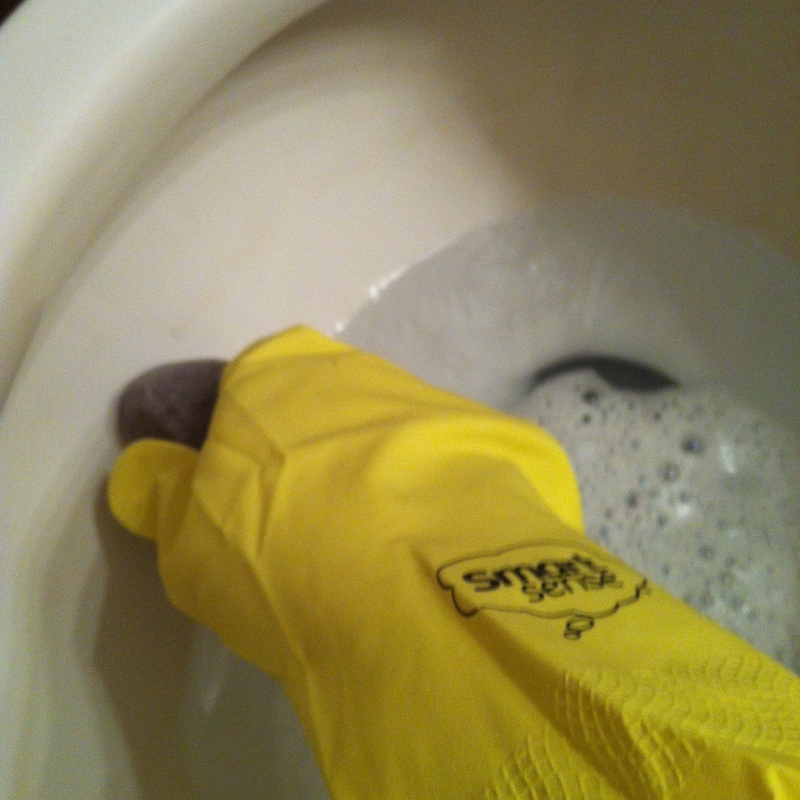 Don’t forget to use your rubber gloves! 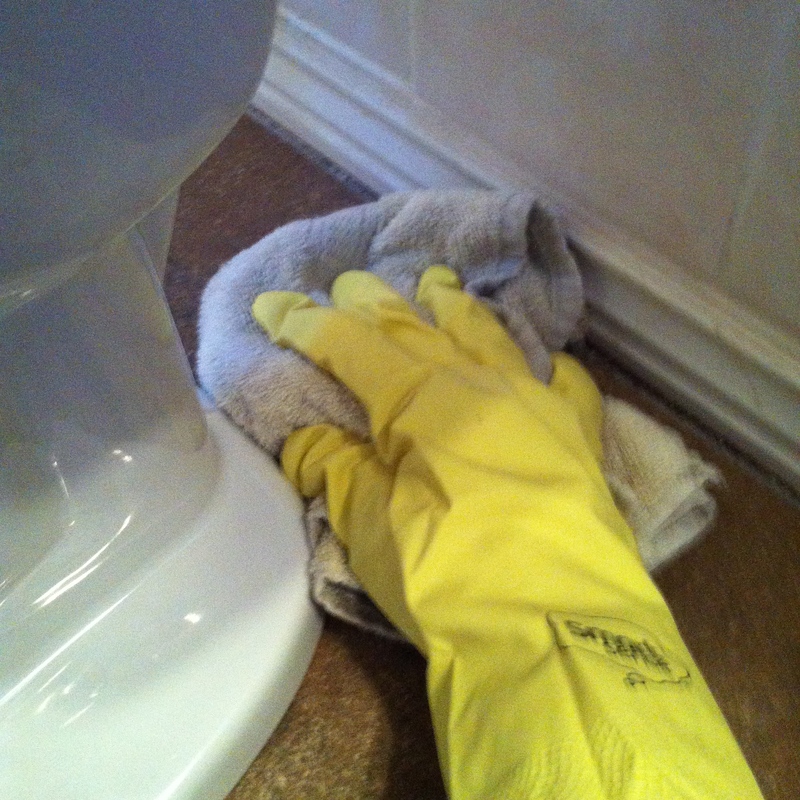 It is nearly impossible to clean behind the toilet with a mop, but with your spray bottle, rag and trusty gloves you wont be afraid to clean behind the toilet. And before you know it, clean floor! 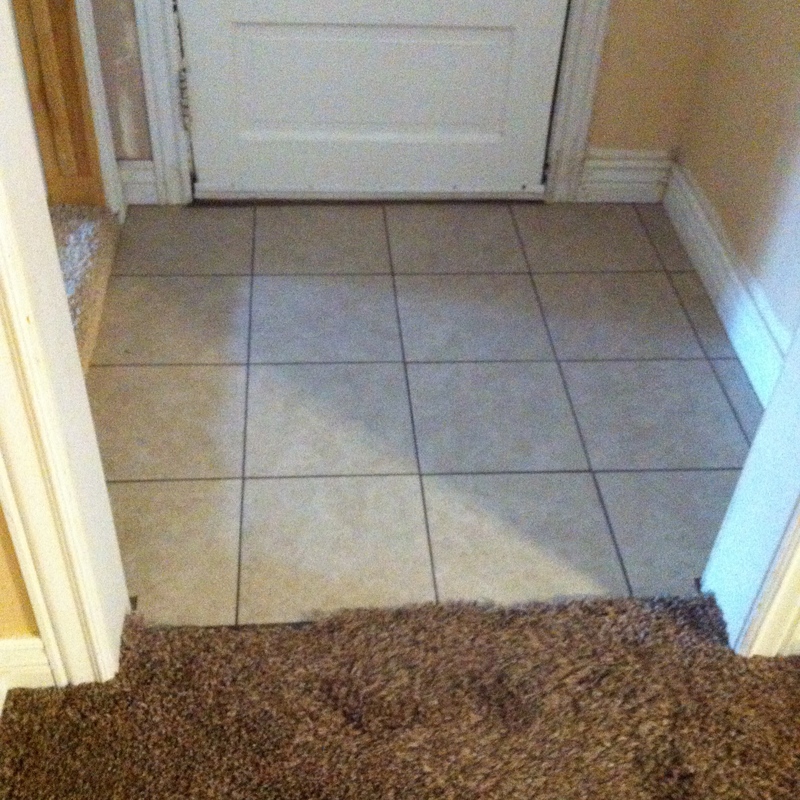 Beside getting a superior clean hand washing, you can walk on the floor immediately and put your laundry basket and trash can back immediately as well. 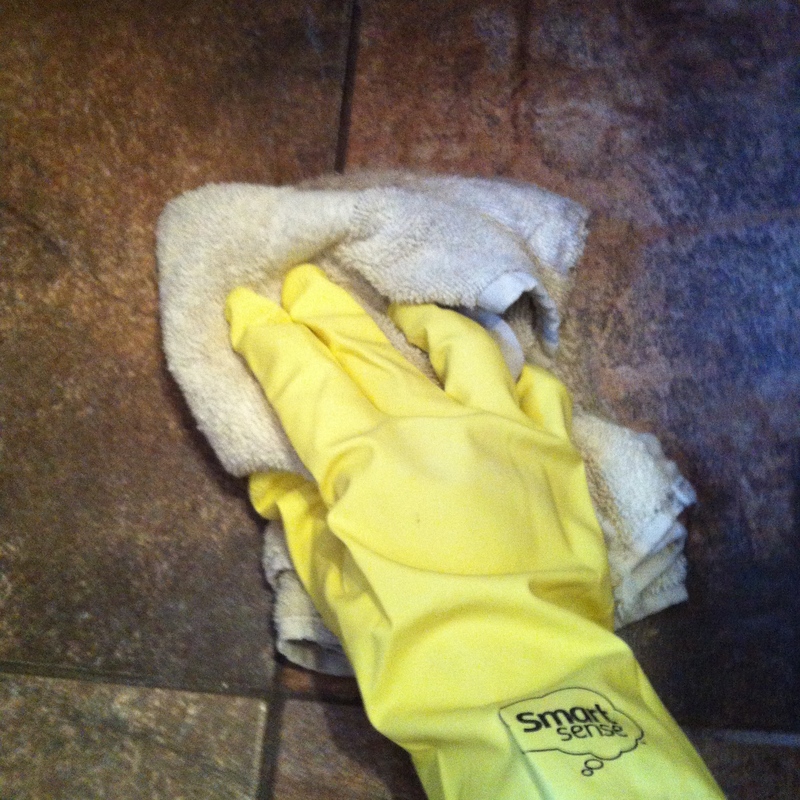 Hand washing the floor can and should be used on any small floor. This is how I clean by our backdoor, and when I cleaned professionally we also did most kitchens this way as well. I am so so sorry for the unexpected two week break in my weekly cleaning tips, I haven’t been feeling well and thus, have gotten behind. 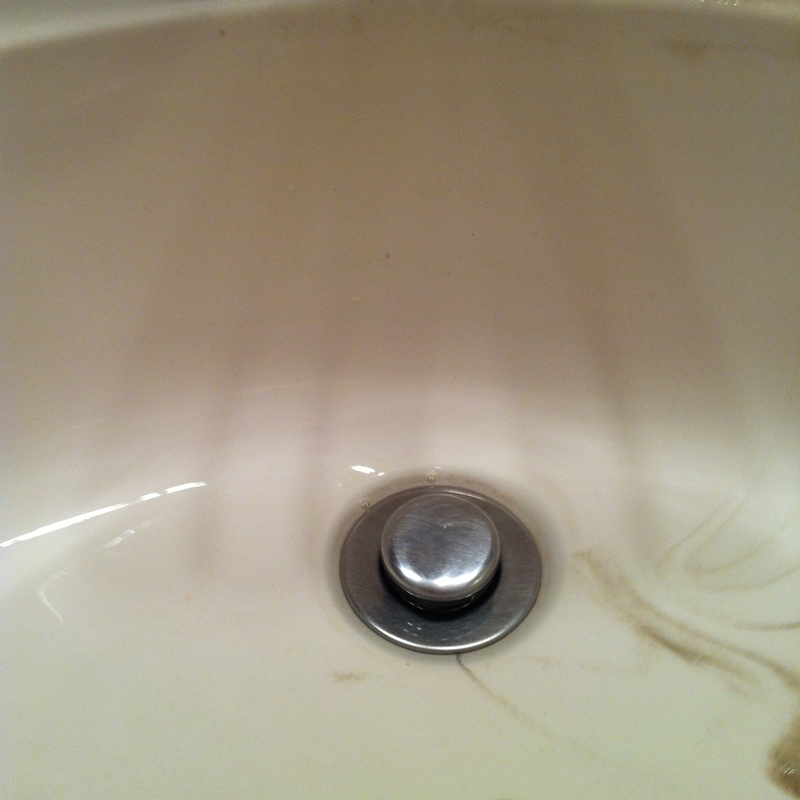 But without further adieu, I share with you, how to clean Dirt Rings. 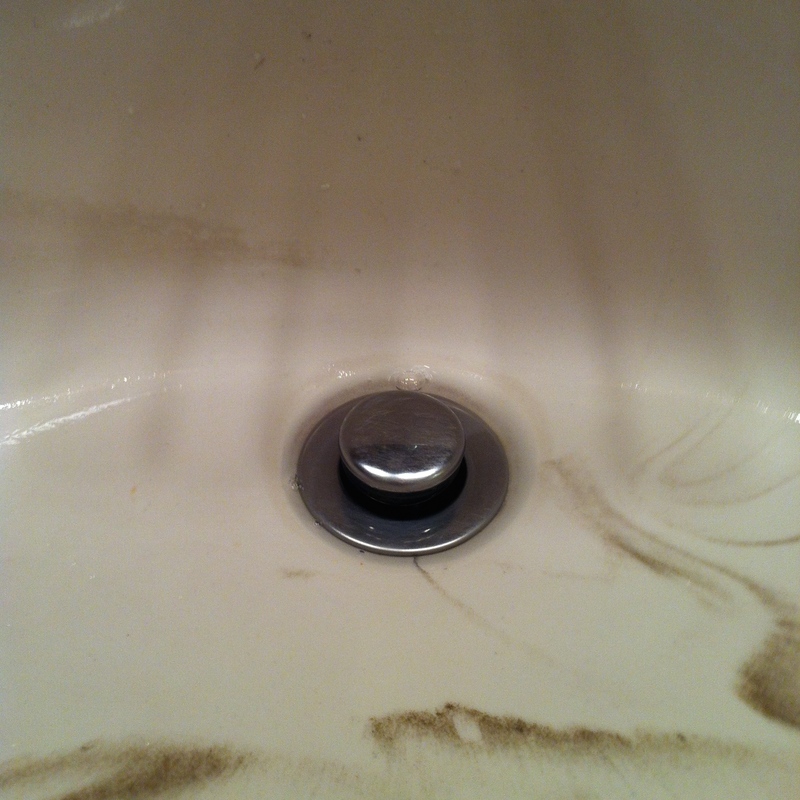 Dirt rings are so, so gross. 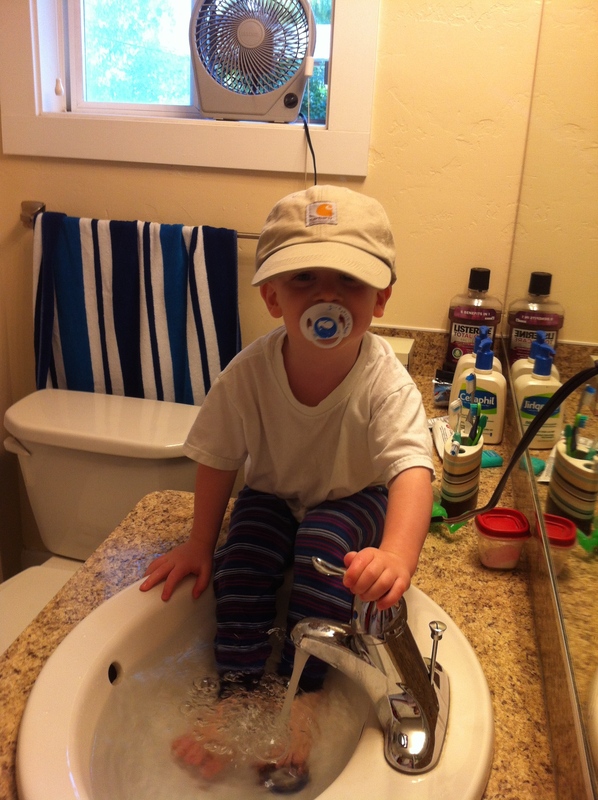 And honestly, I can say that I never saw one in a bathroom sink until we moved into this rental! But whether the ring is in your tub or sink, you CAN get rid of them! 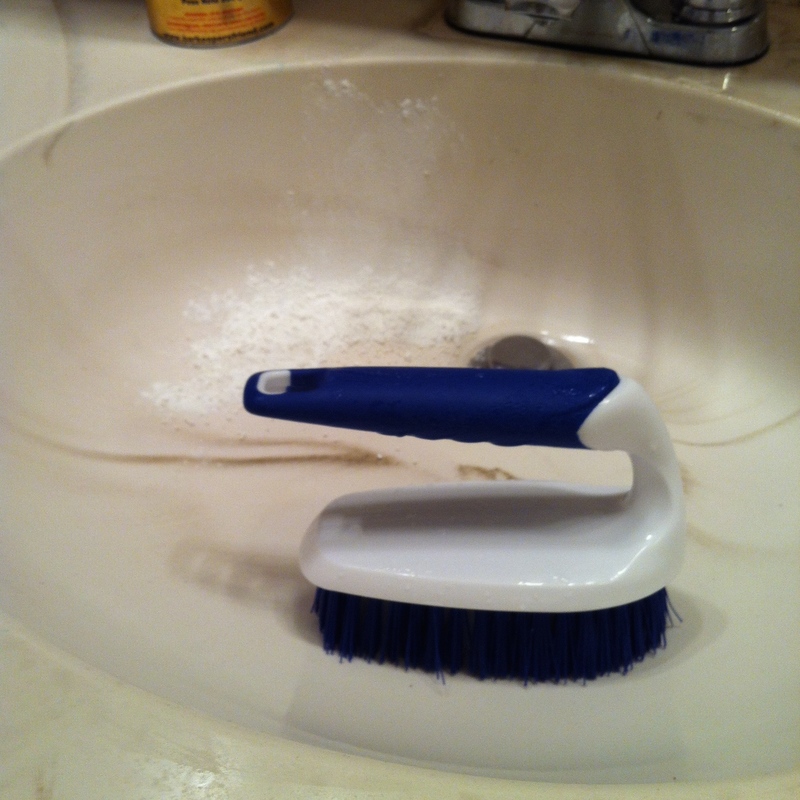 I wont lie though, it takes elbow grease and……. 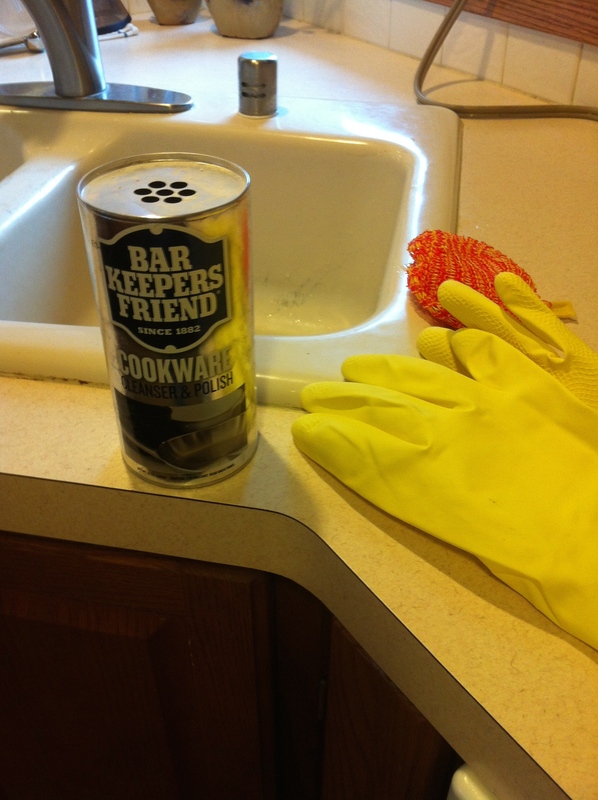 I LOVE Bar Keepers Friend, it is cheaper than Comet and I think it works just as well if not better. 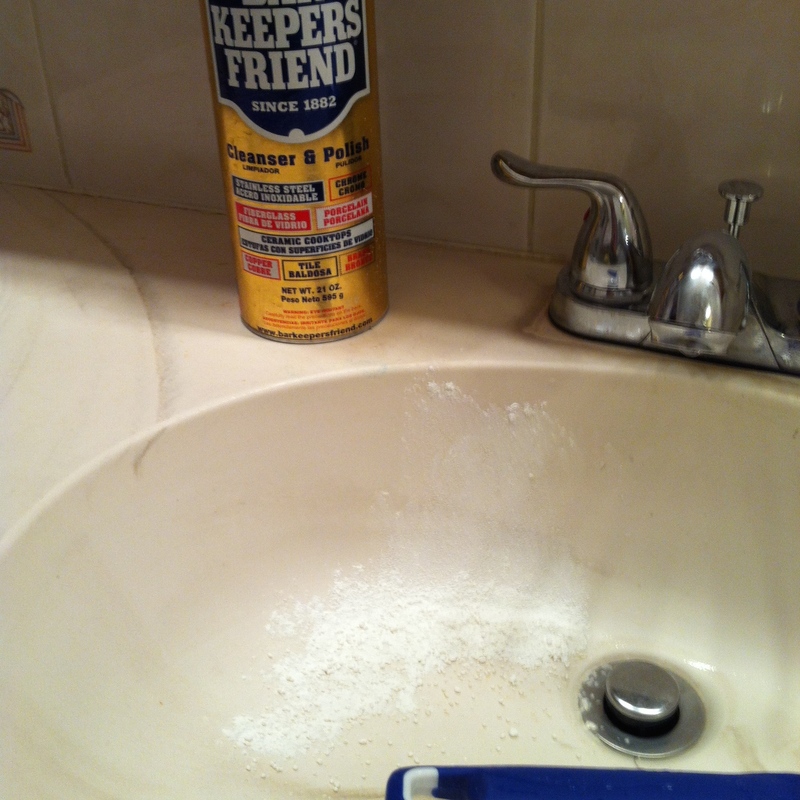 It is also mostly odorless and doesn’t leave that chemically smell you can get from Comet and other similar cleaners. 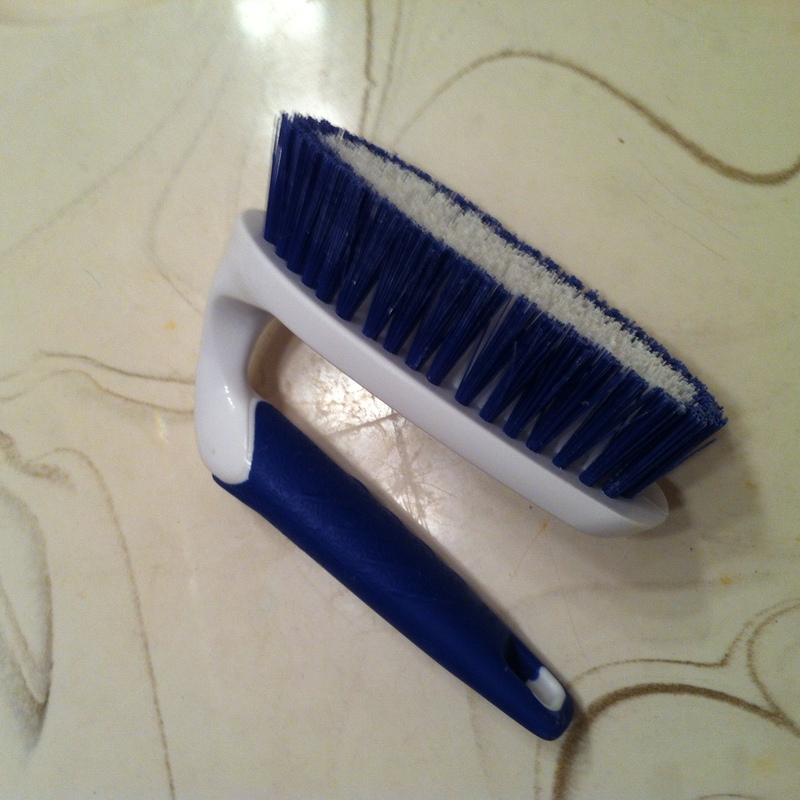 You also need a STIFF handled (my preference) scrub brush. 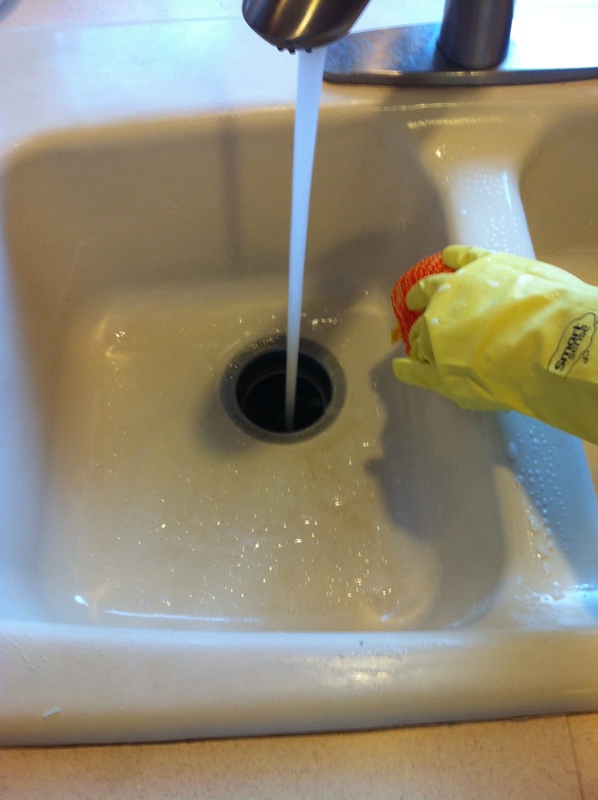 First you are going to put on your rubber gloves and get the sink damp, just run the water and splash it around the sink, primarily on the ringed area. 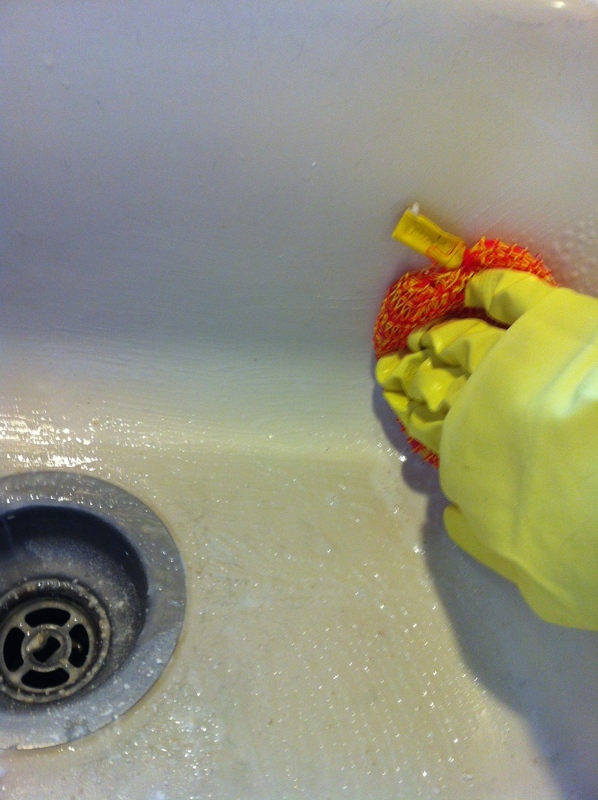 Then you will shake Bar Keepers (or equivalent) on the ringed area and around the drain. And now you can prepare yourself because it is time to scrub the dickens out of that nasty, dirty ring. 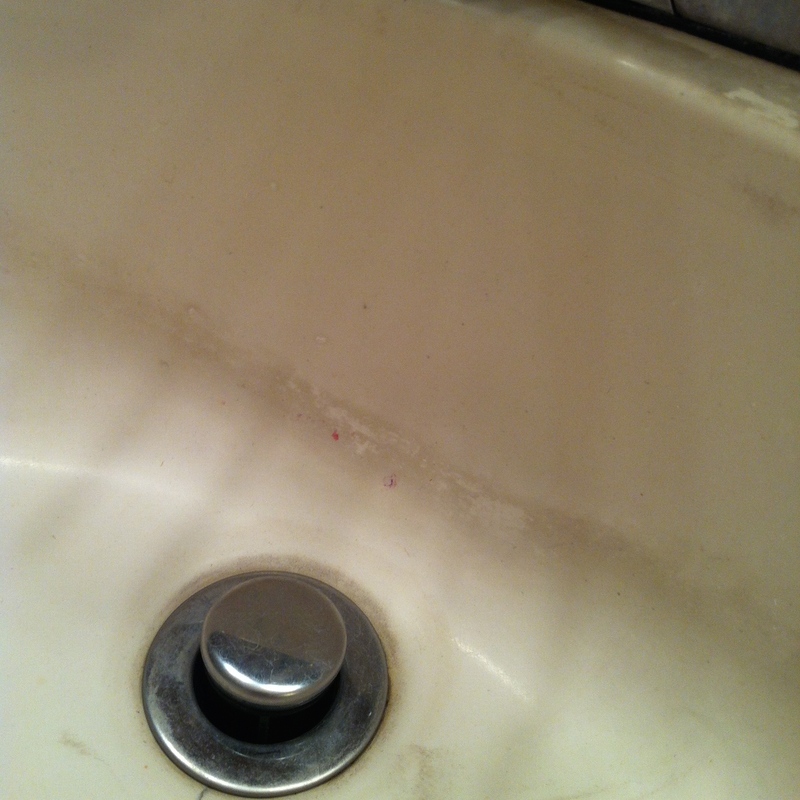 In this picture I have scrubbed a little more than half the dirt ring and only for a minute or so. Serious improvement no? 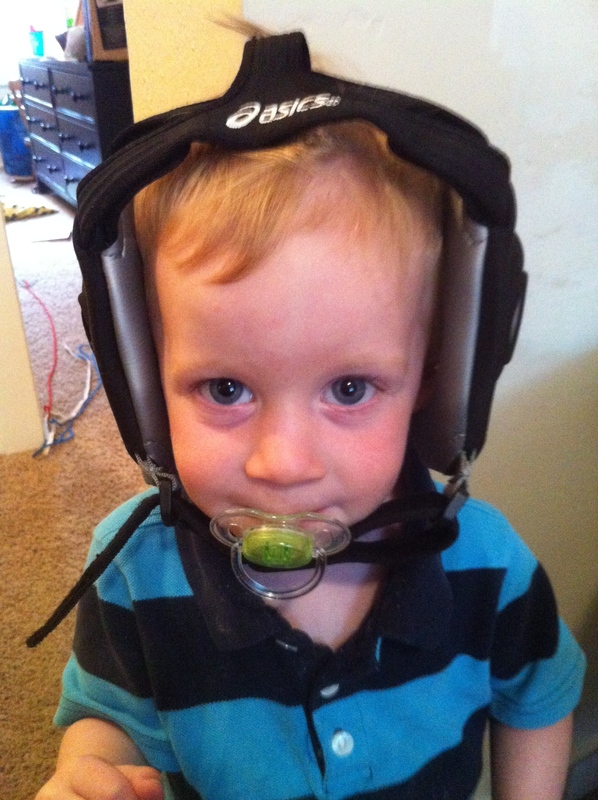 Then you will repeat on the other side of the dirt ring. And WOW! Cleanliness is restored! 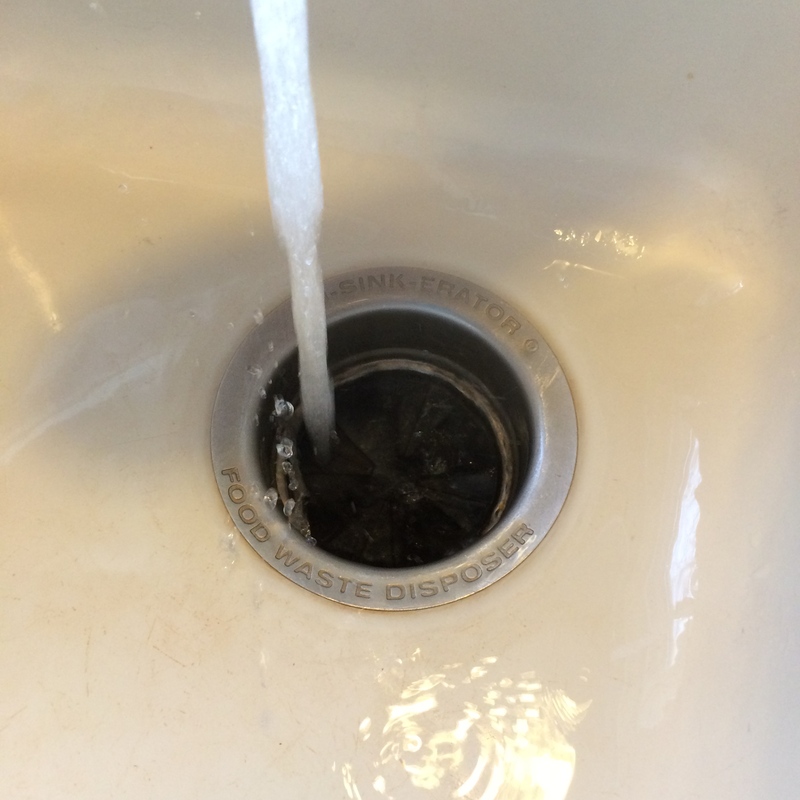 Having a ring in your toilet isn’t terrible, but… it looks pretty gross. So here is a fast and easy way to get rid of that ring in 2 minutes or less. 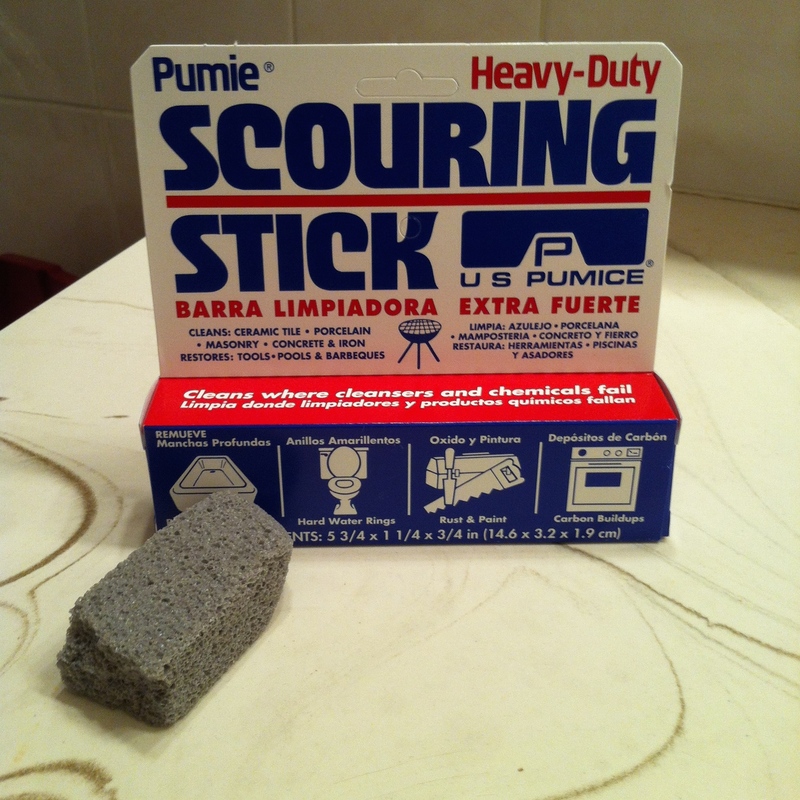 The scouring stick is actually the length of the box, I generally break them in half to use them. I find the full length a little too long to comfortably handle. You can find these at any Wal Mart or grocery store. They can be a bit pricy for a piece of stone, like $5, but it is worth the money! 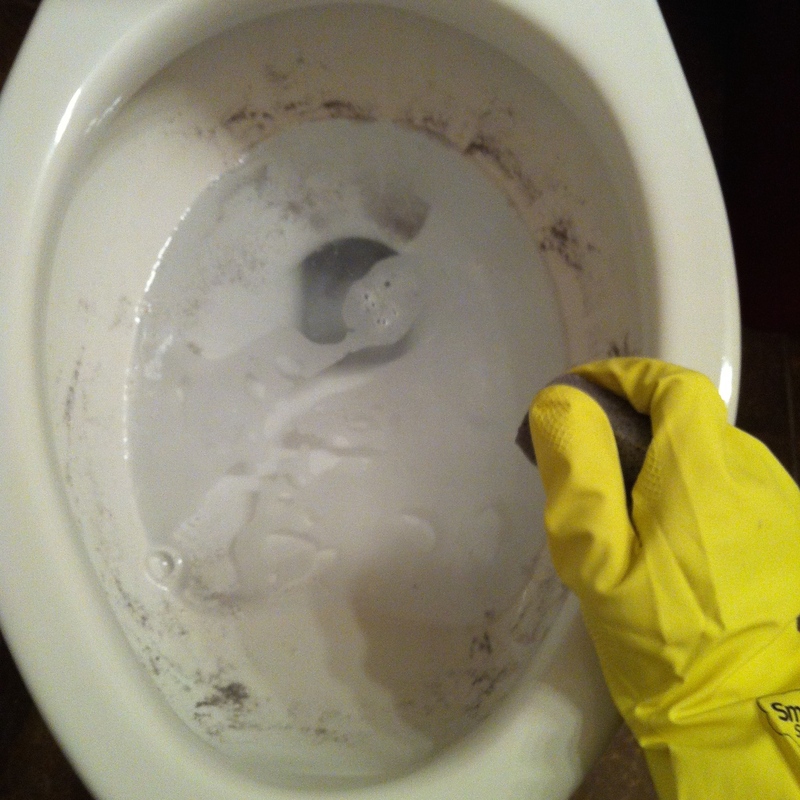 First you are going to want to put on your handy dandy rubber gloves and then give your toilet a good scrub. Then flush the toilet and get scrubbing. 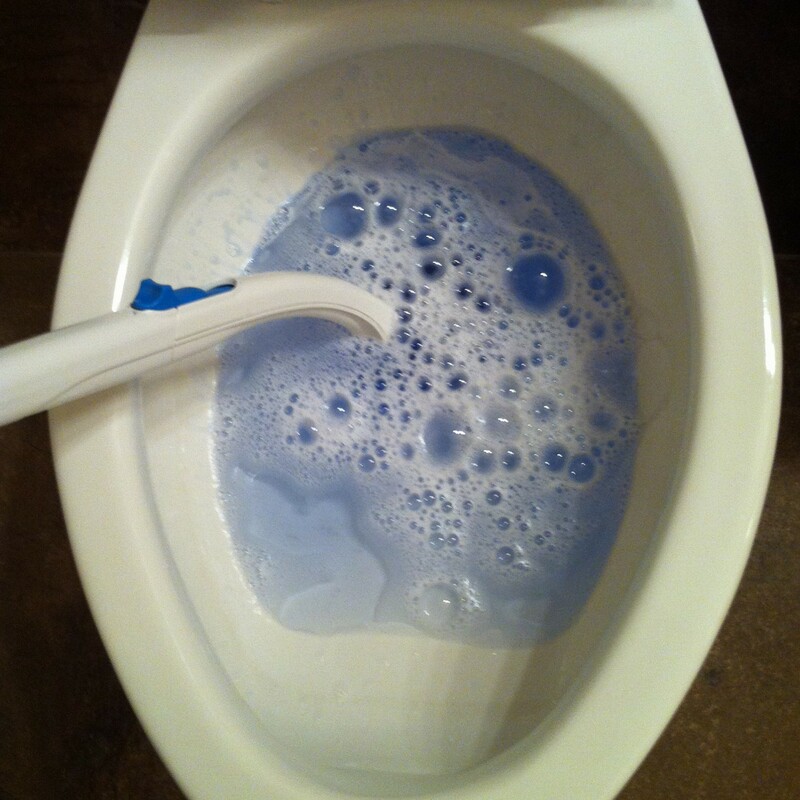 The pumice stone will sound like it is grinding against your porcelain throne, but never fear, it wont damage your toilet at all, just scrub all the yuck off. 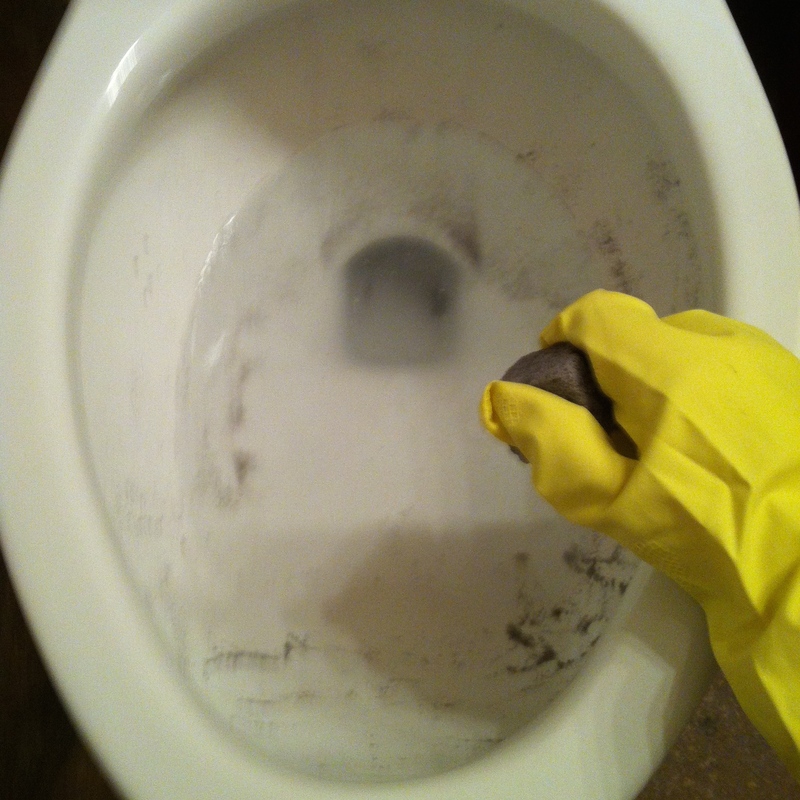 Then flush the toilet and reinspect to see if you missed any spots. And give it another once-over if needed. And WHAM! 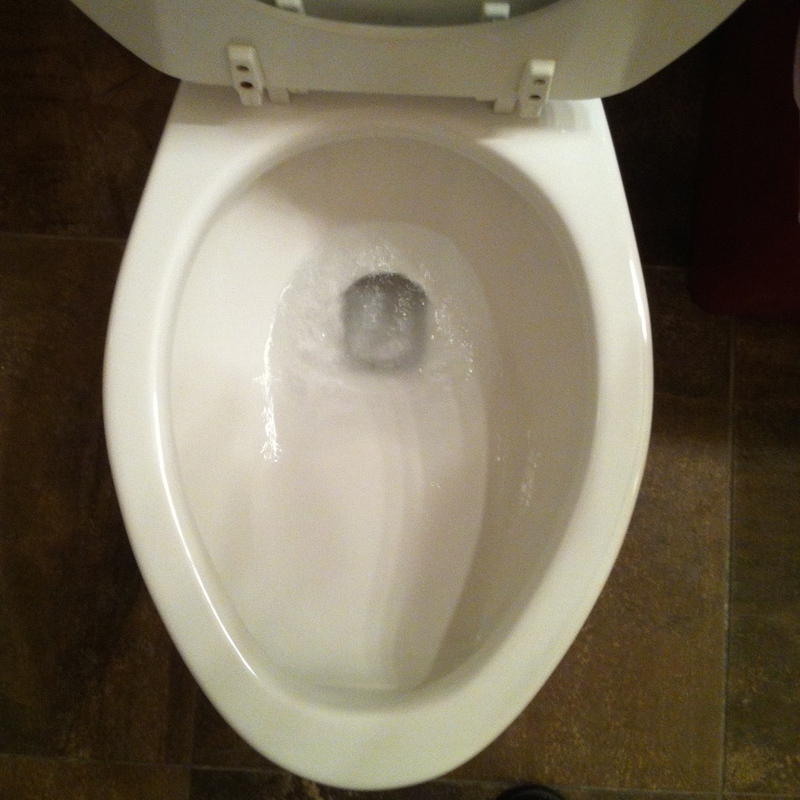 A beautiful, clean toilet you can be proud of in just minutes. 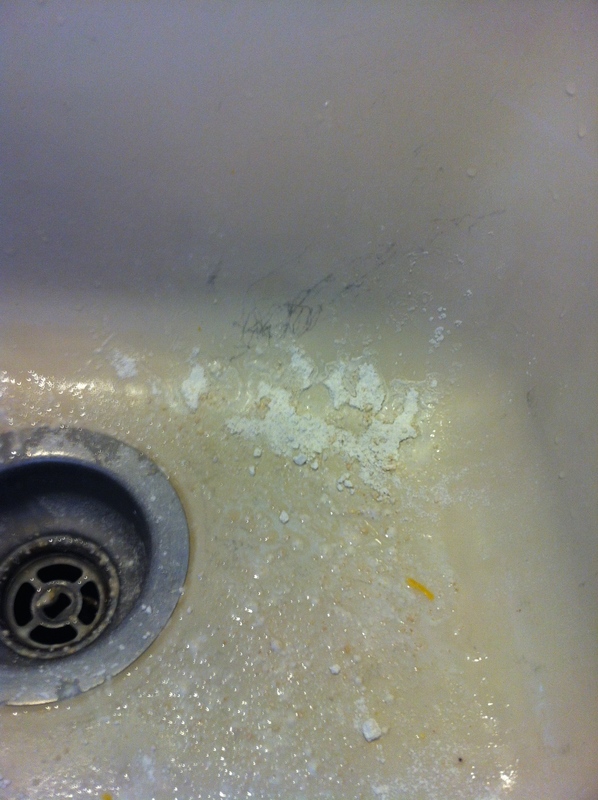 And just an FYI, I always keep a Clorox toilet tablet in the tank to keep those yucky rings from reappearing. Which definitely makes for easier cleaning in the future. 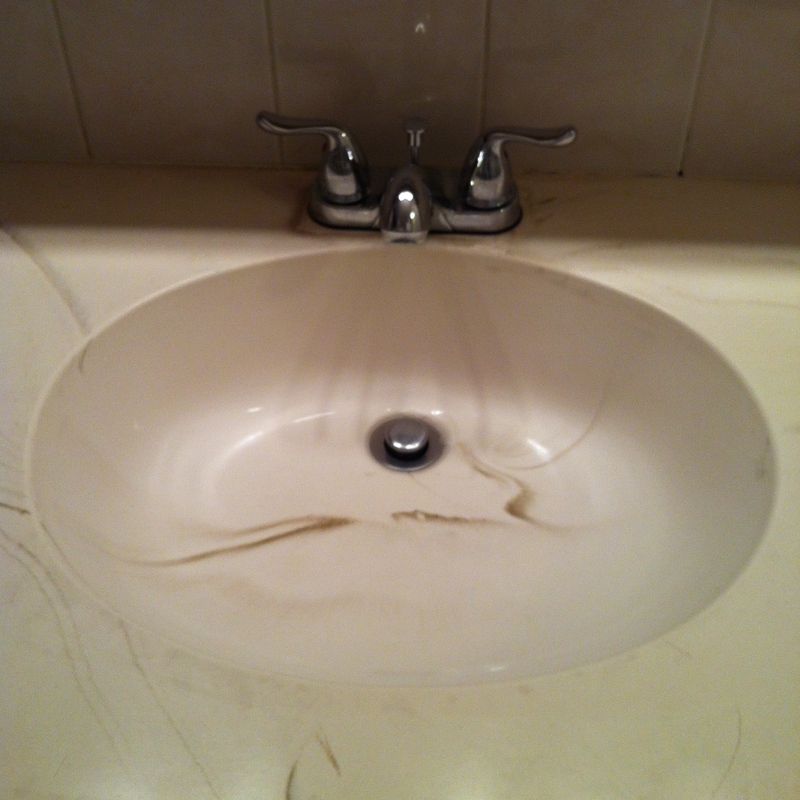 This isn’t something I thought was necessary at all until I was professionally trained to clean. 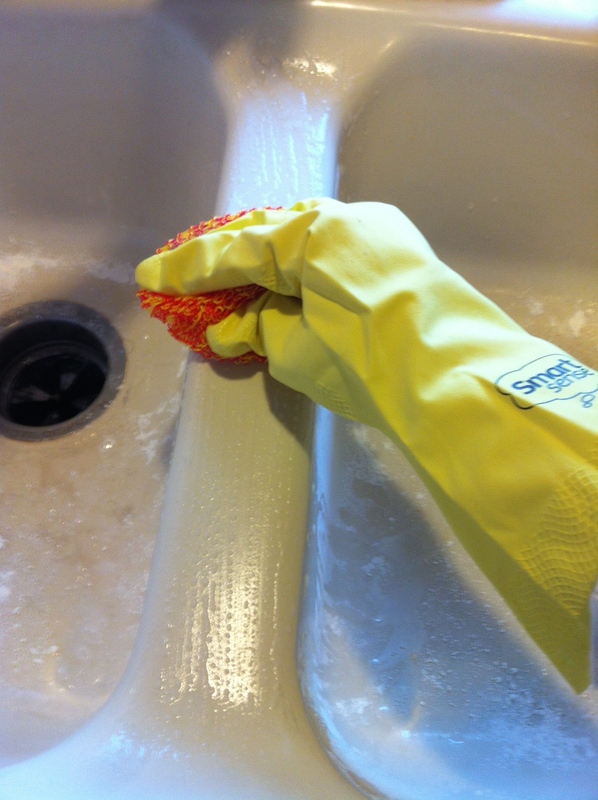 You are much more likely to get in there and get hard to reach places and gross places nice and clean if you have a glove barrier. 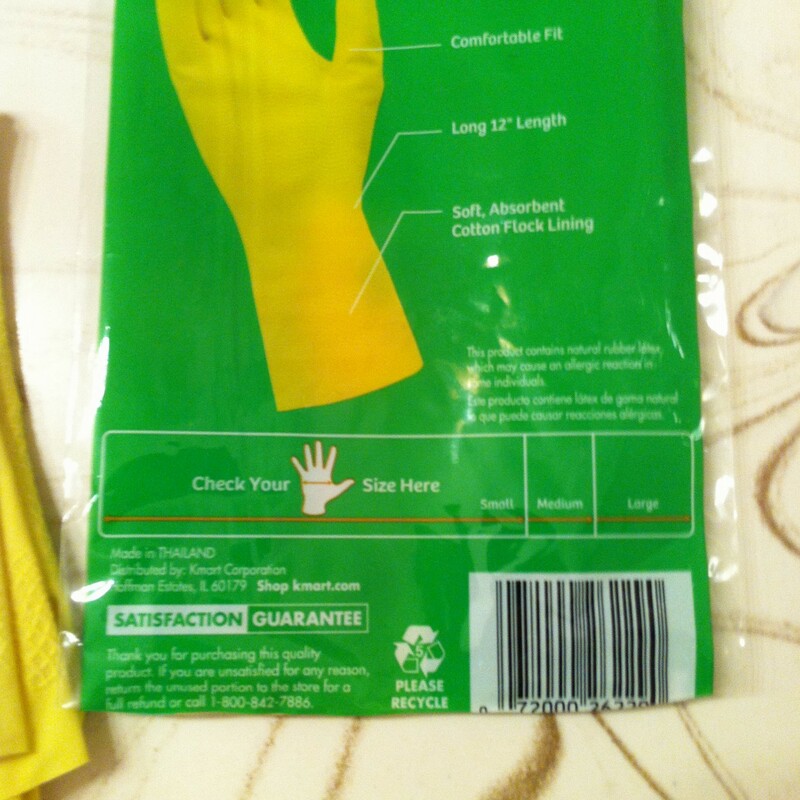 I buy cheap rubber gloves, they are just $1 or $2, and I buy several packs at a time, this way I don’t get upset when my gloves get a hole in them. I just toss them out and grab a new pair. If you have long fingers, buy the Large sized gloves, the scale says I need Medium, but I have long fingers so the Large fit me best. If you don’t have long fingers, can check the back of packages for sizing scales. So there you go! 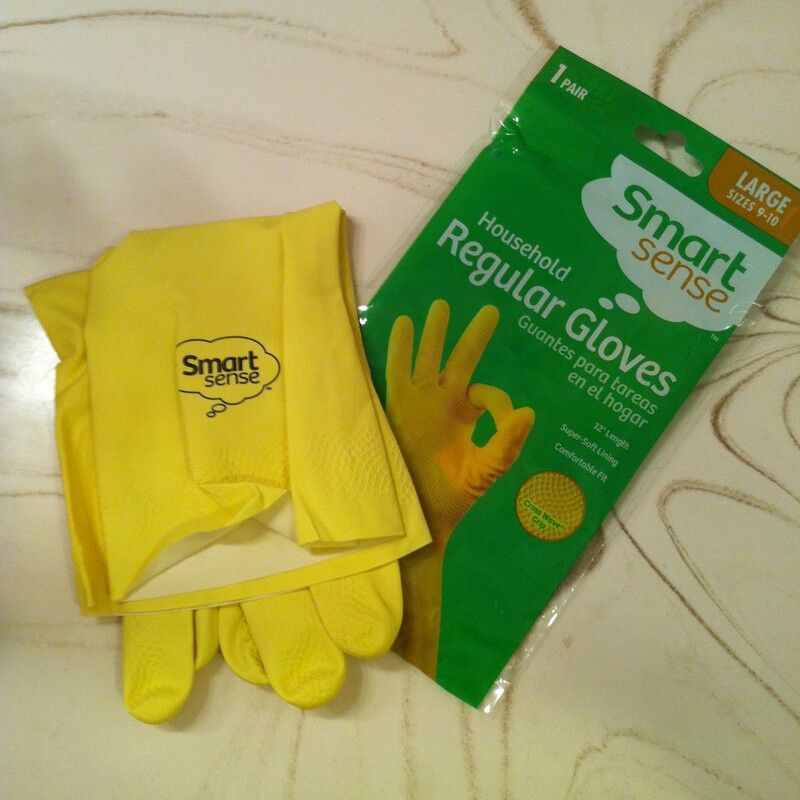 Cleaning Tip #1: Rubber Gloves, it will make a big difference I promise! 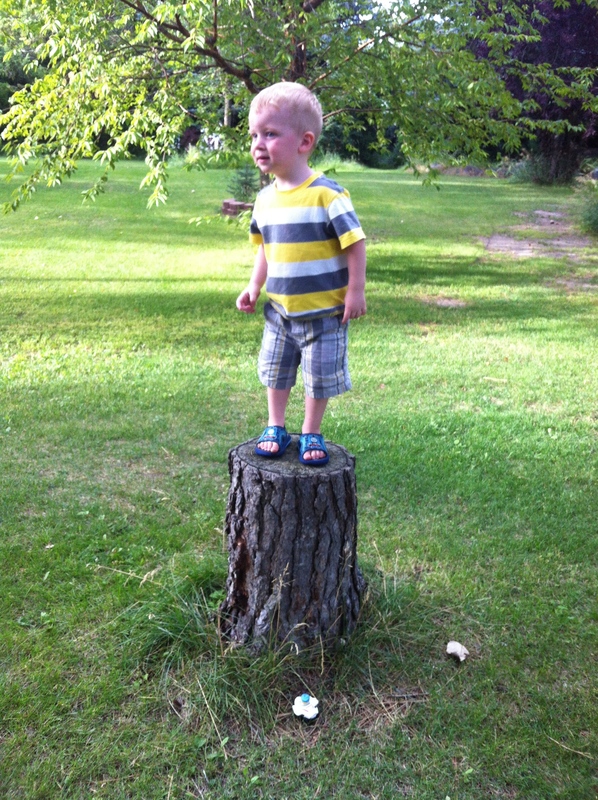 AND he isn’t even two yet. Help!